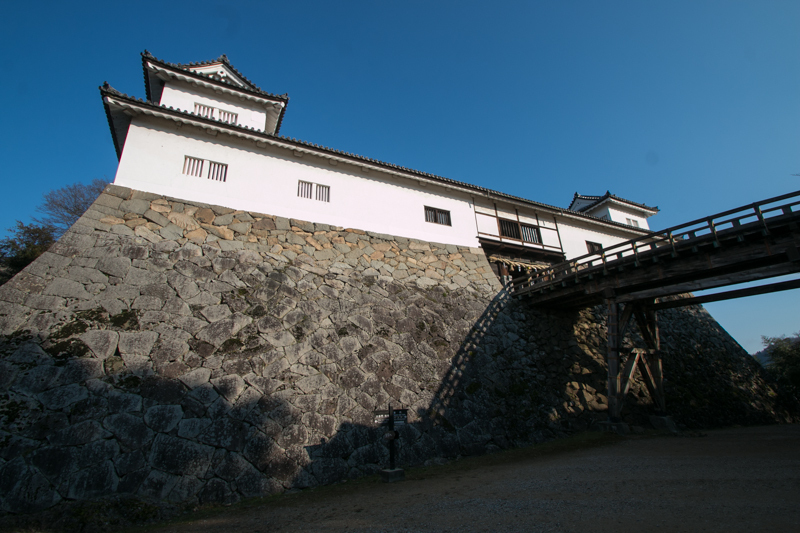 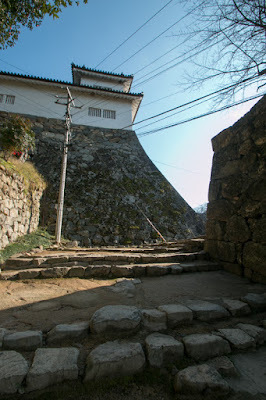 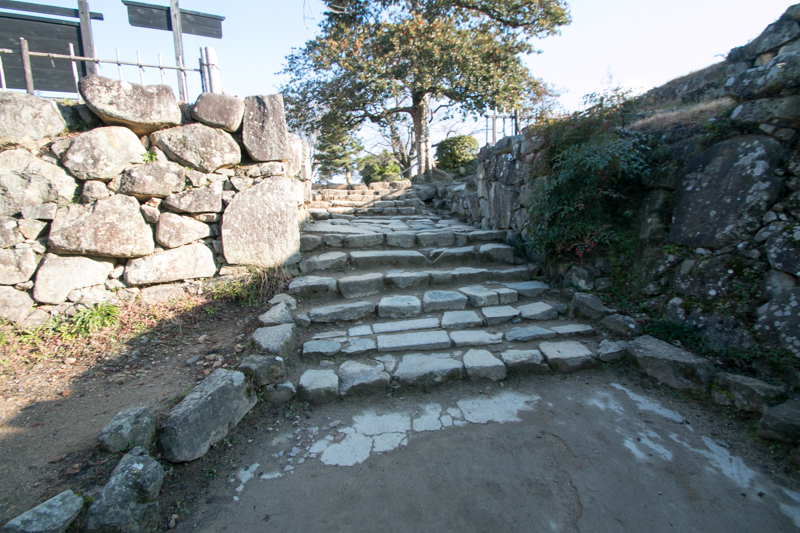 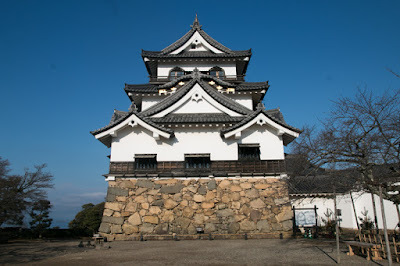 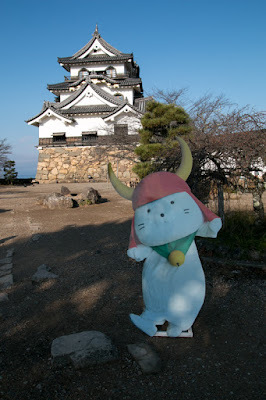 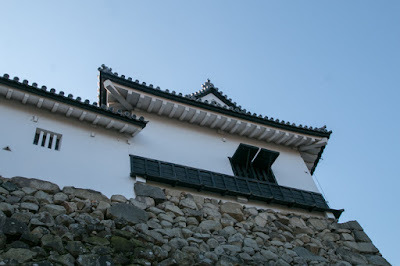 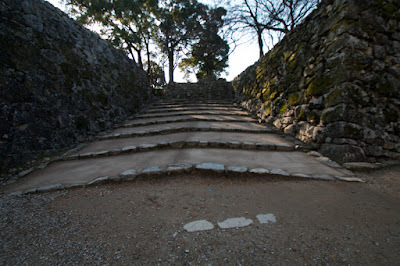 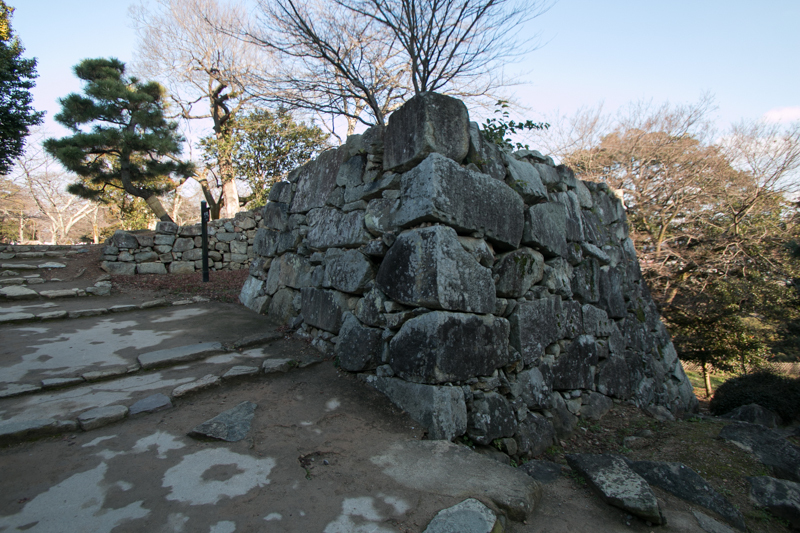 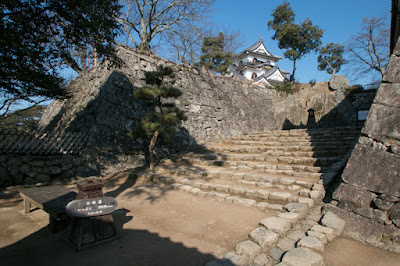 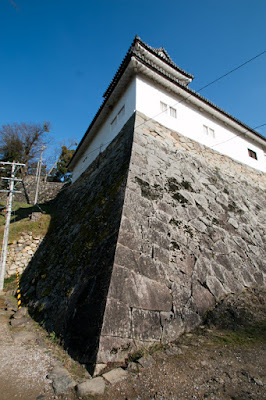 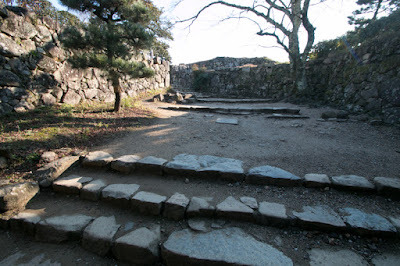 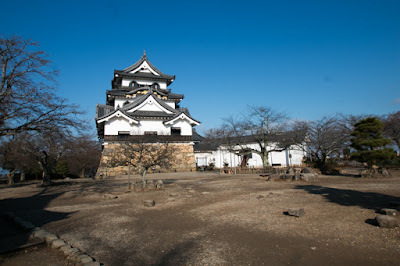 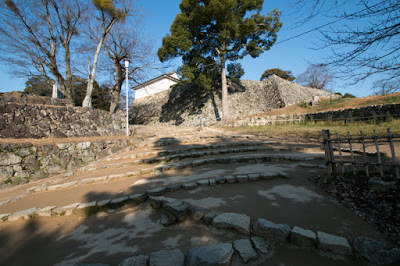 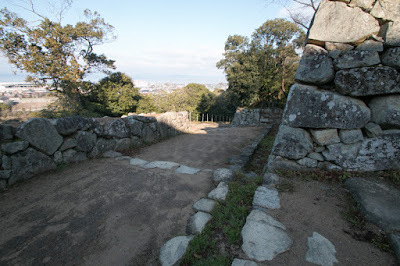 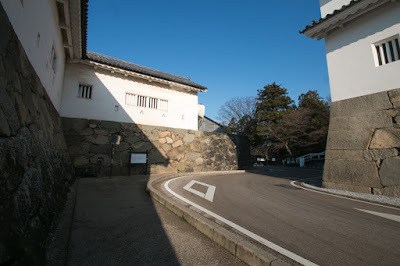 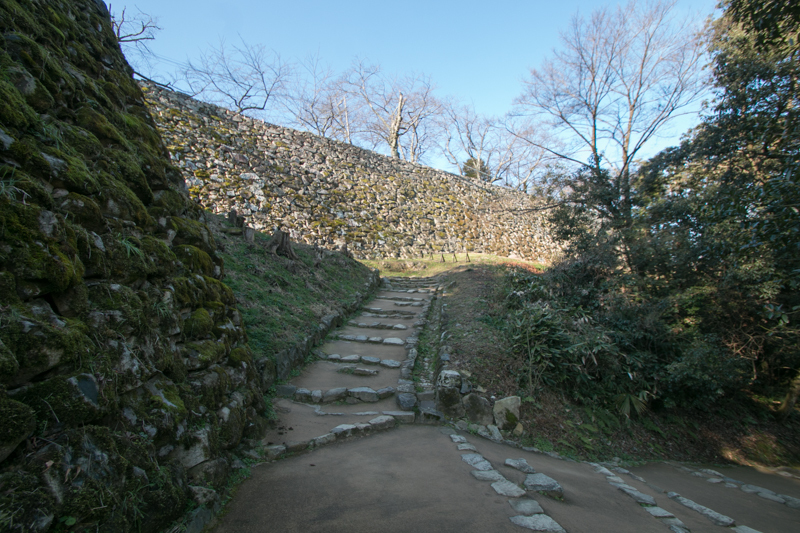 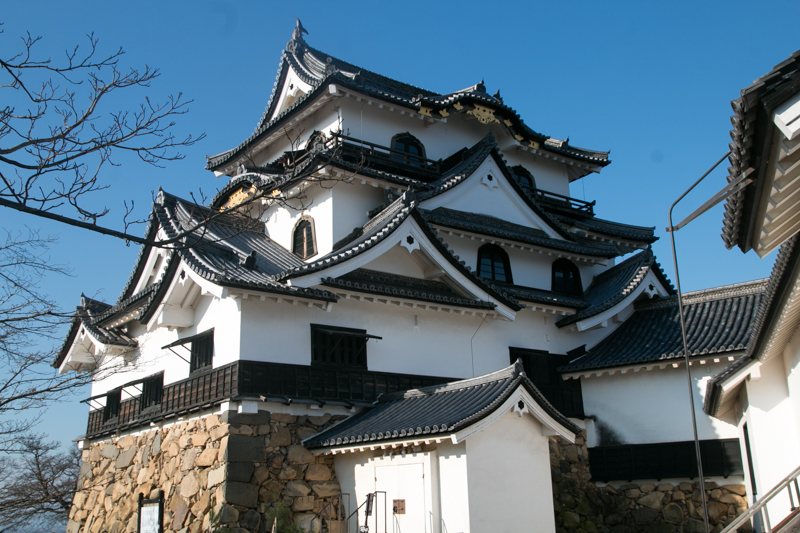 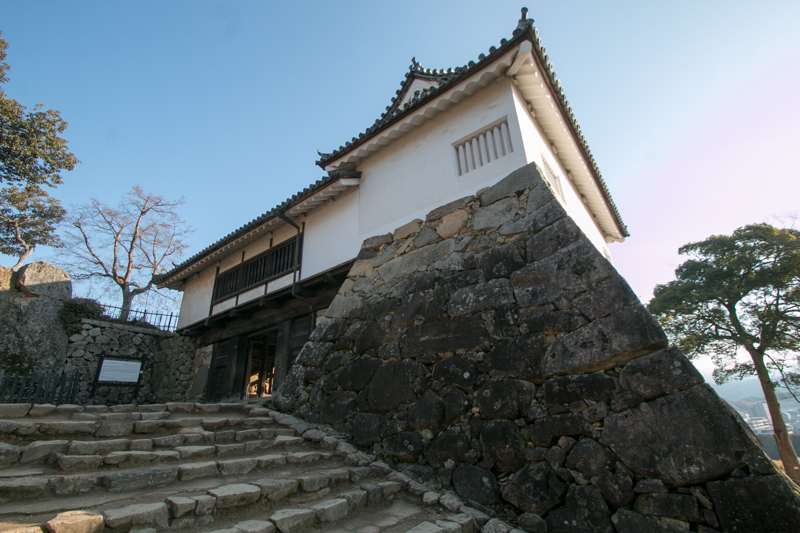 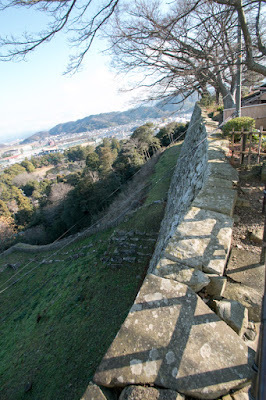 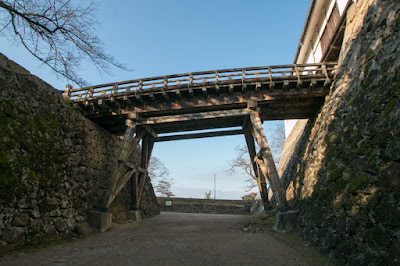 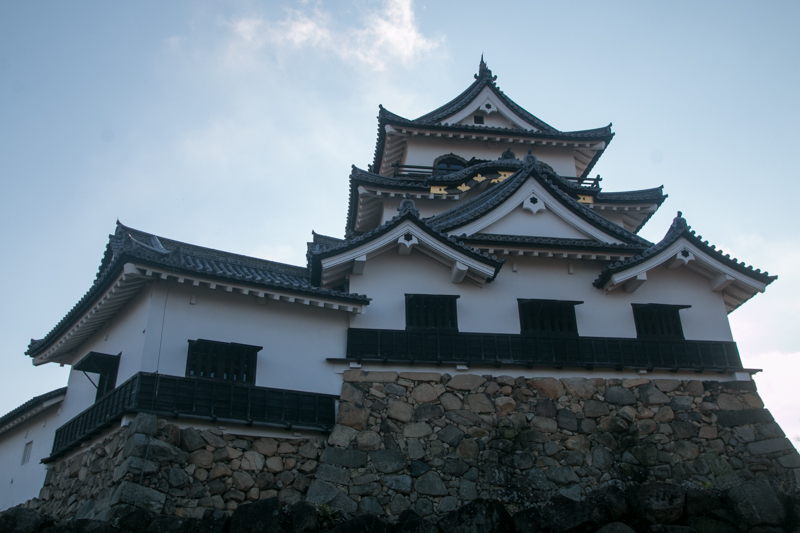 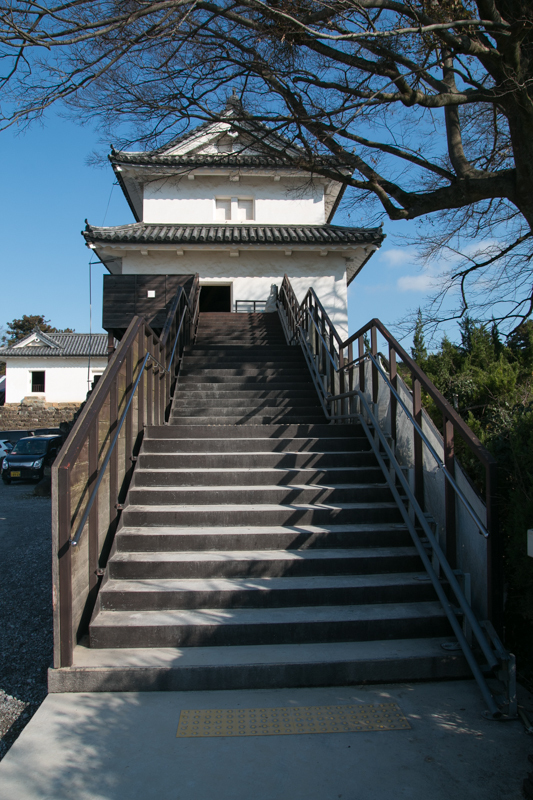 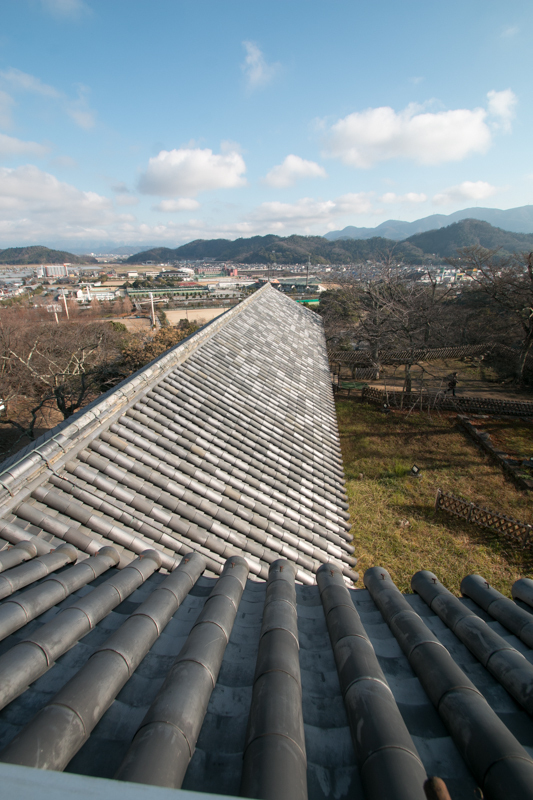 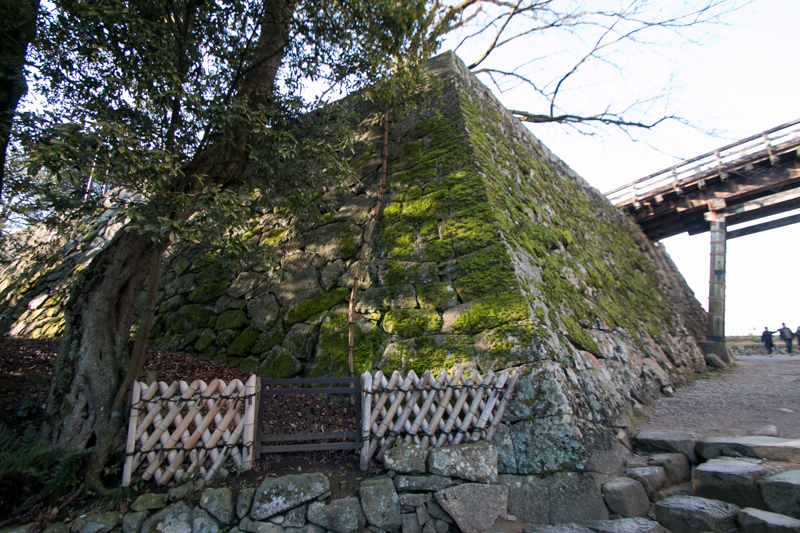 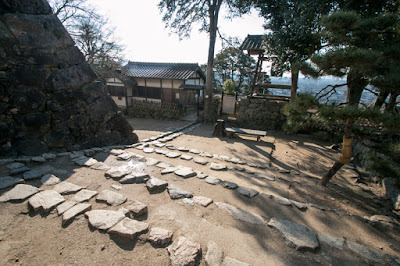 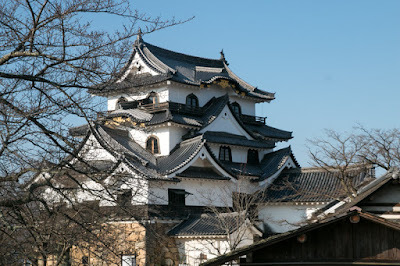 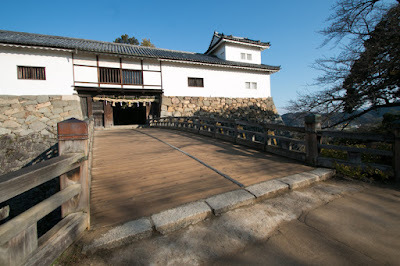 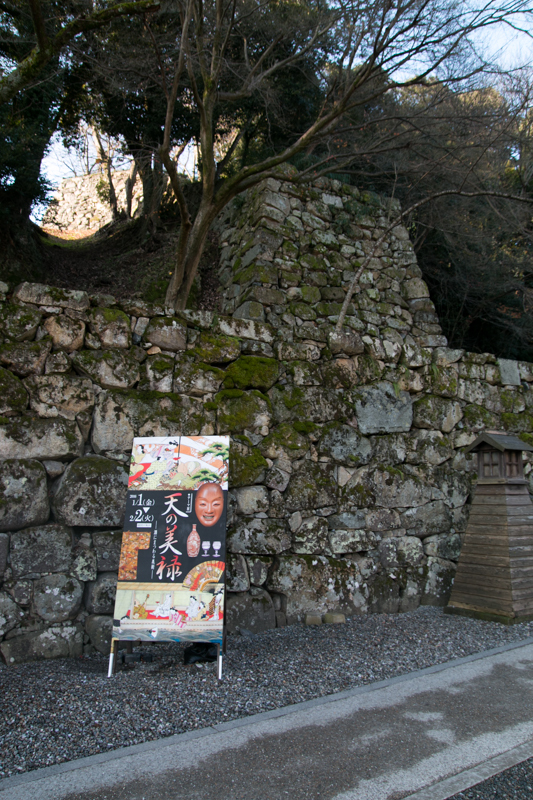 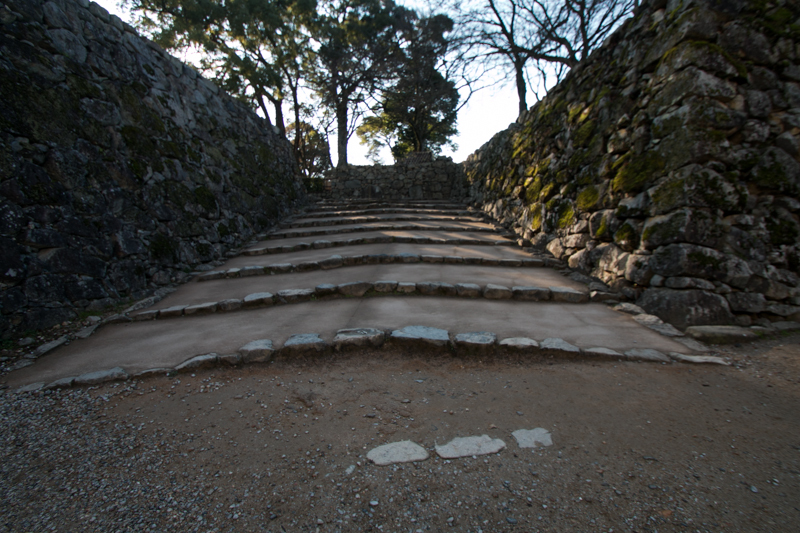 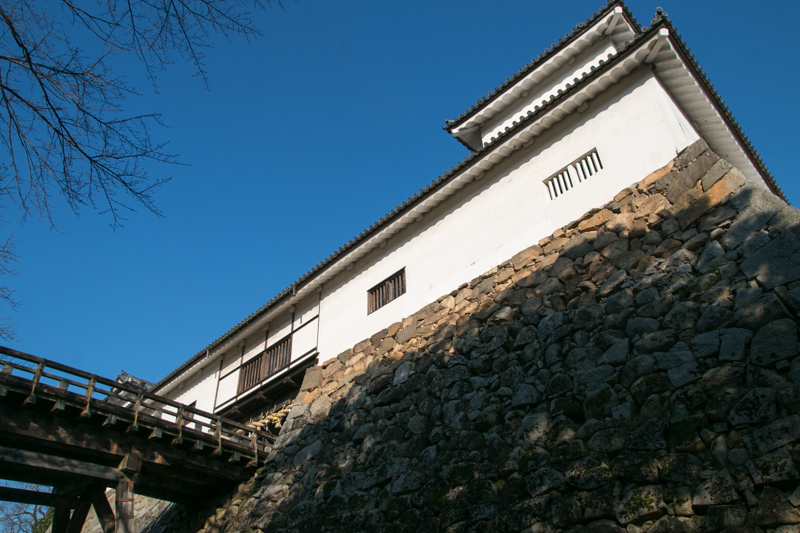 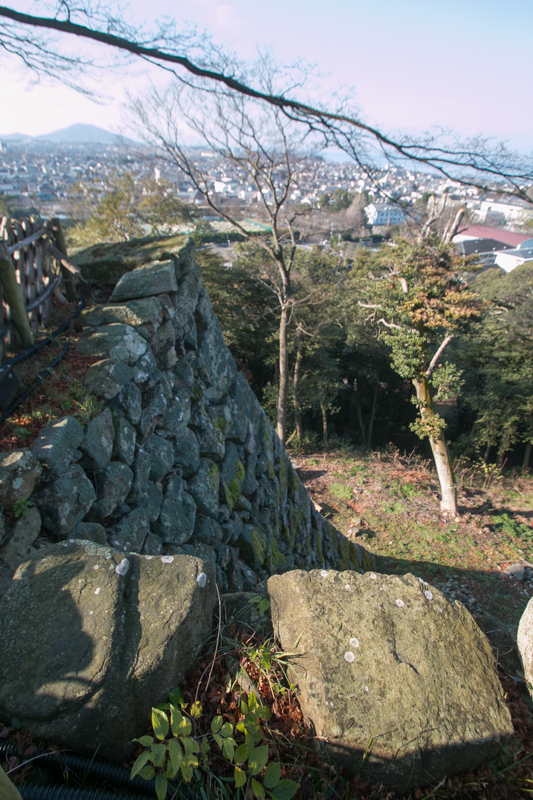 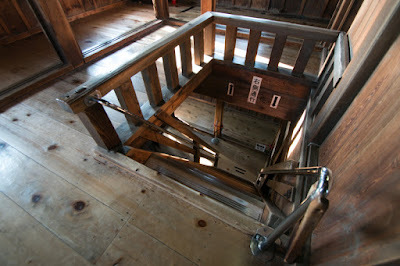 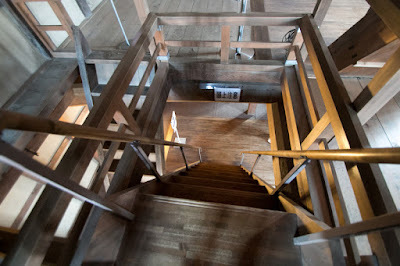 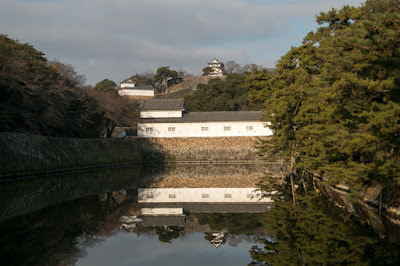 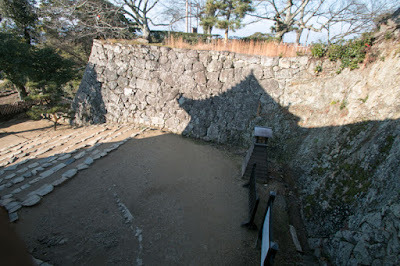 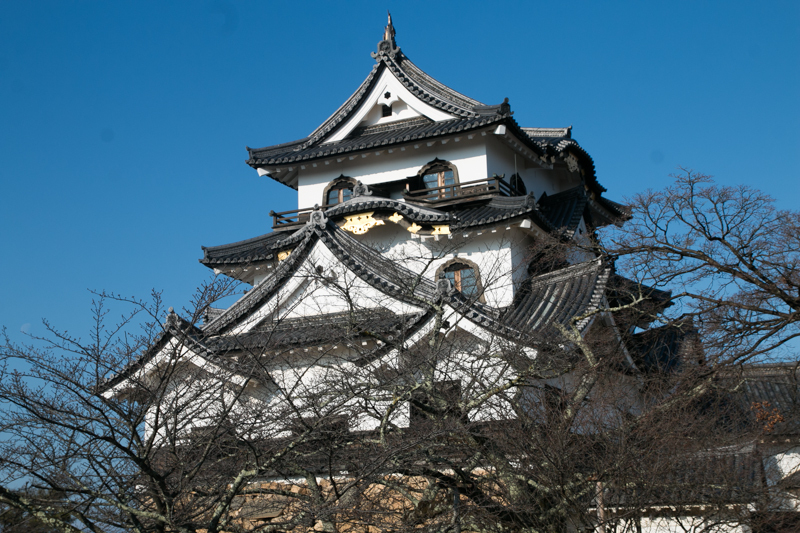 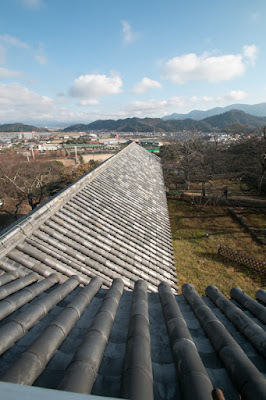 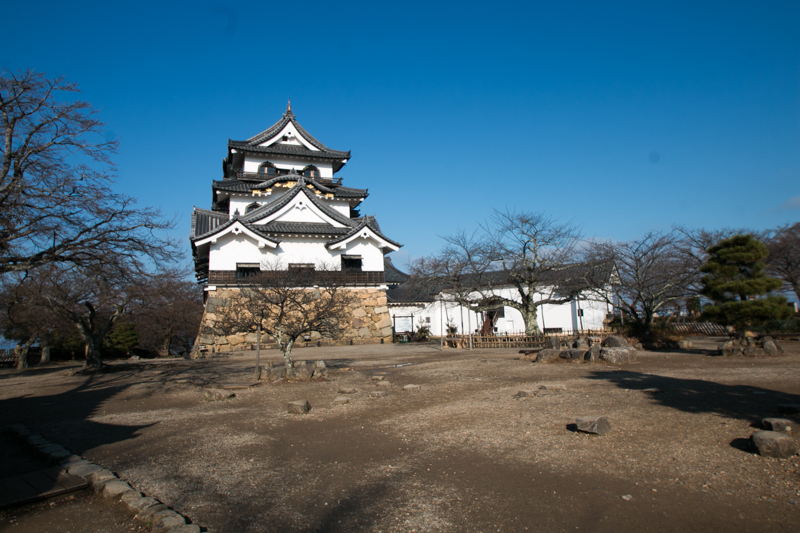 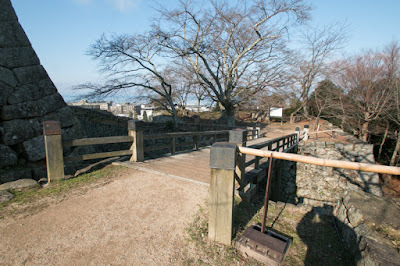 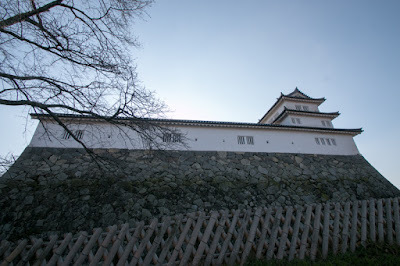 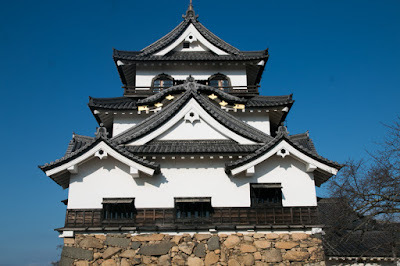 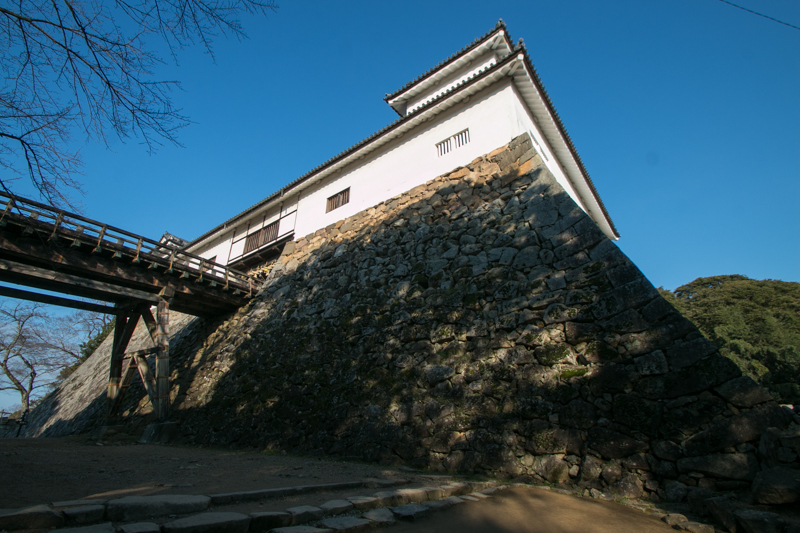 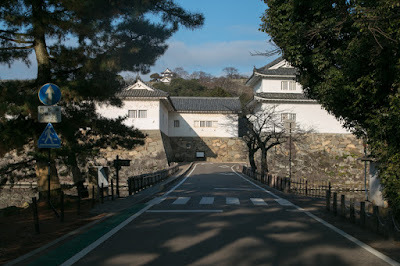 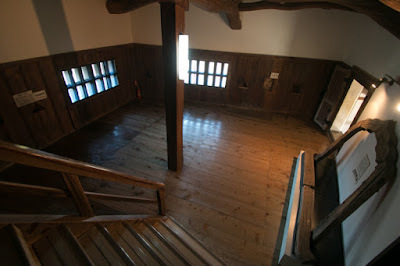 Hikone castle (彦根城) is located at Konkisan hill of about 100 meter high at the center of Hikone castle. 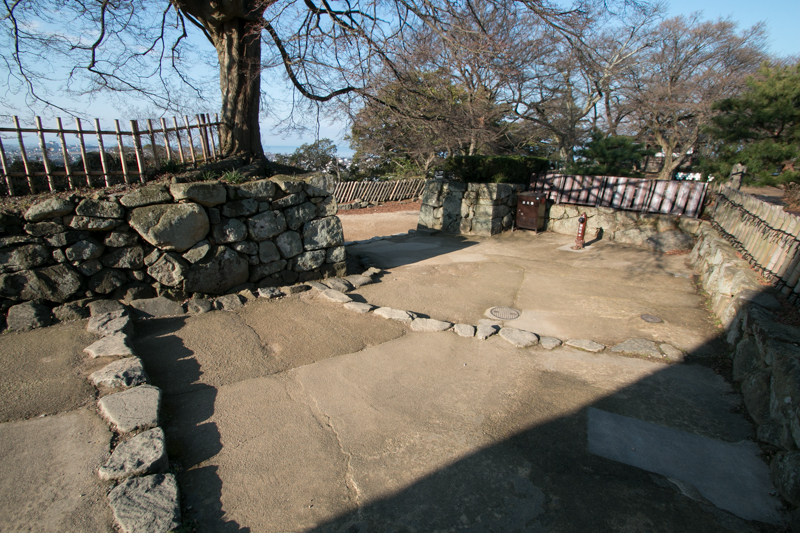 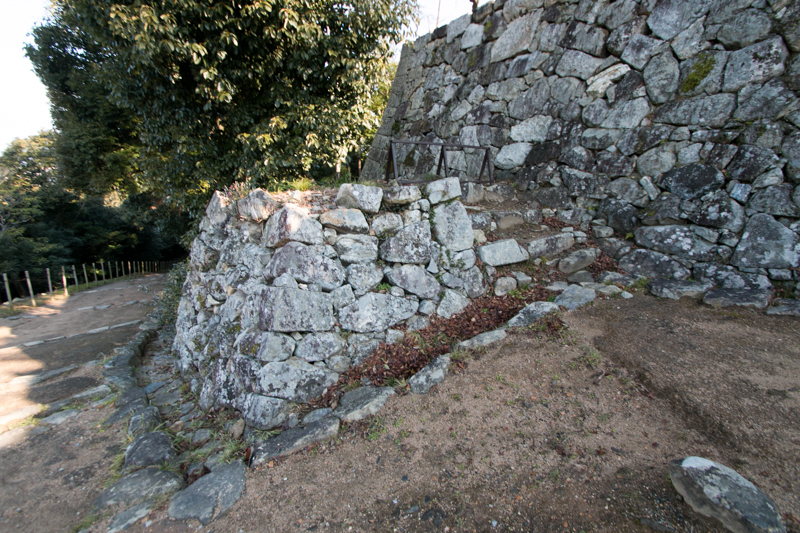 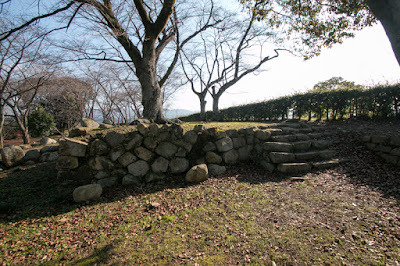 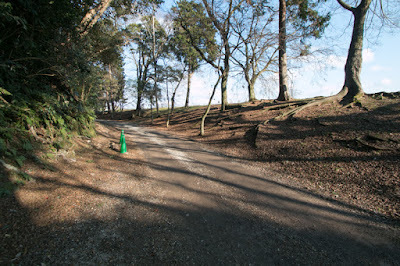 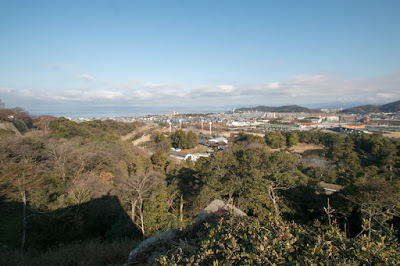 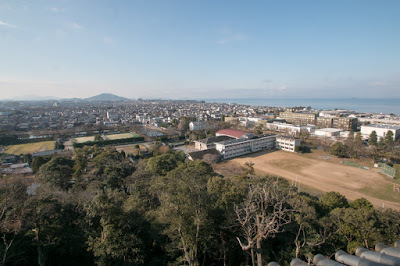 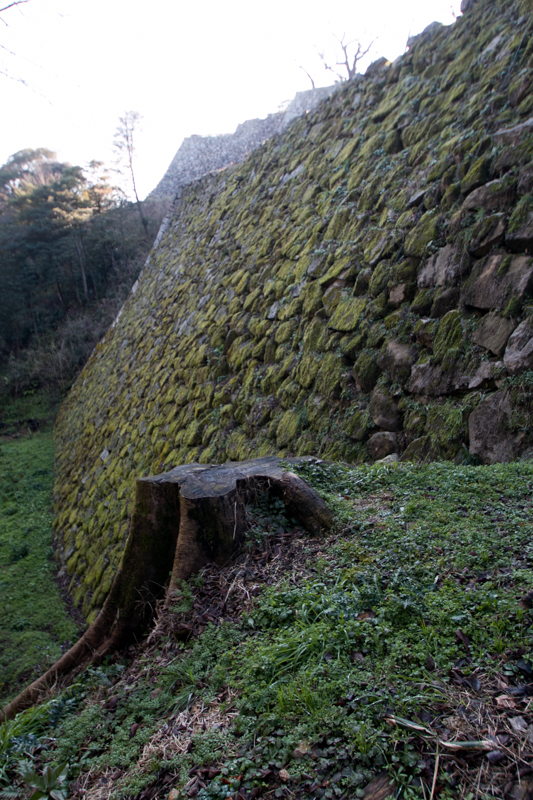 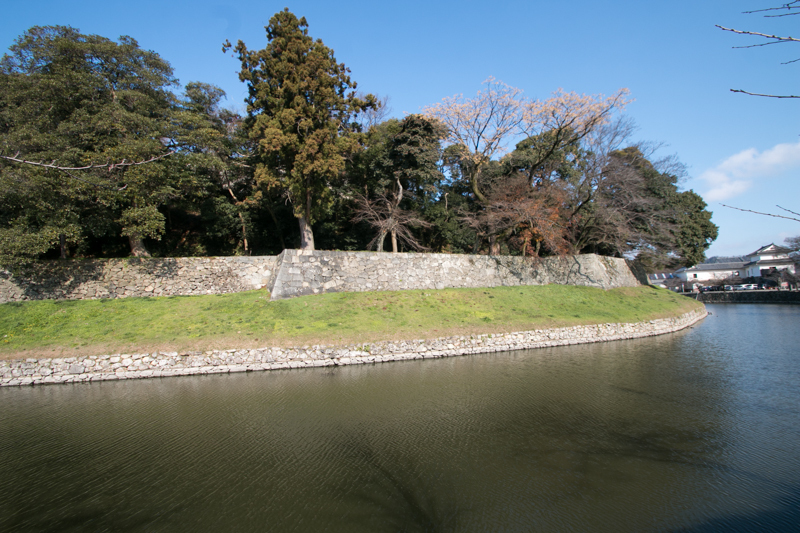 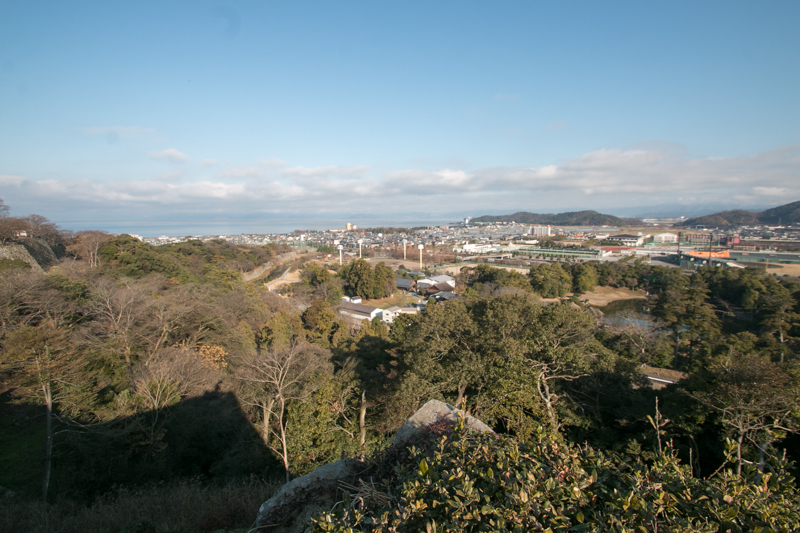 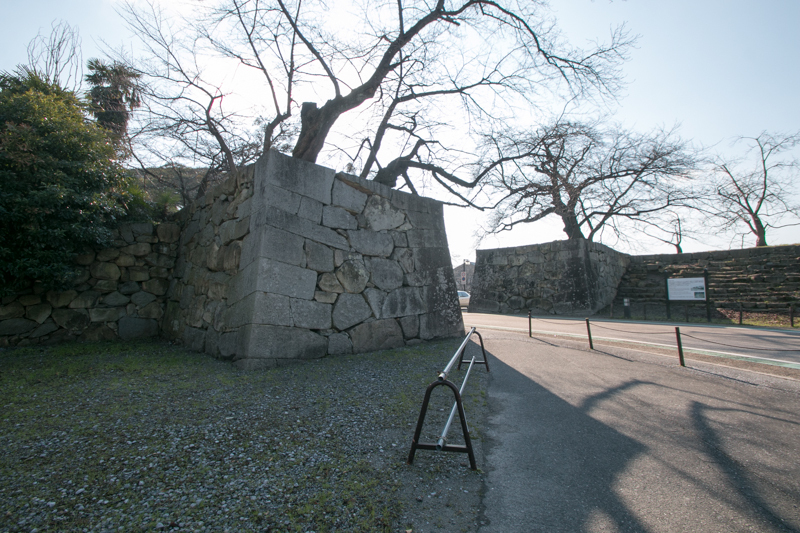 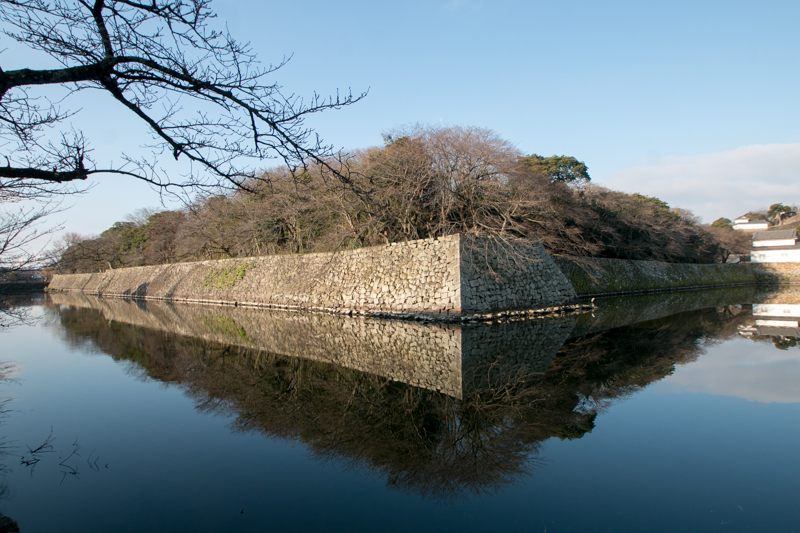 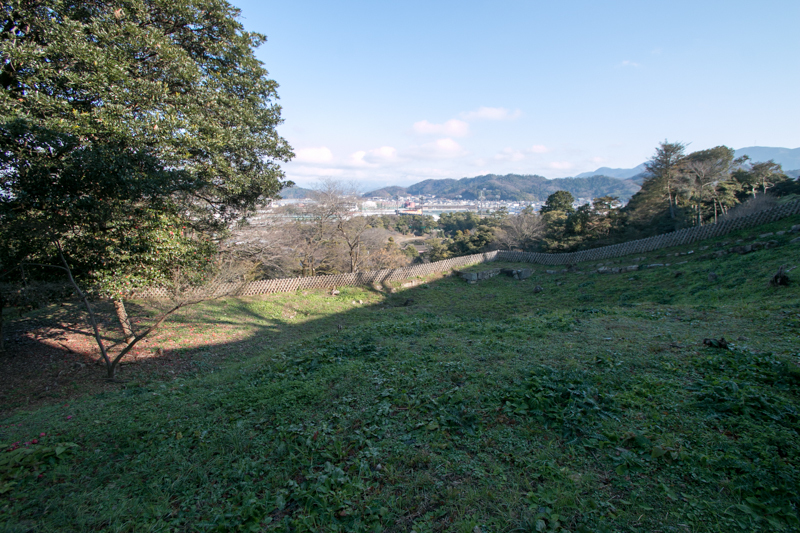 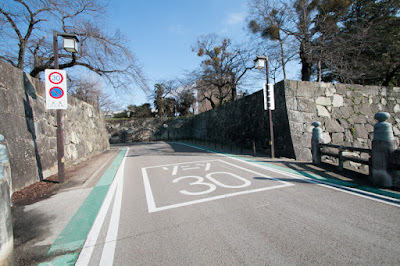 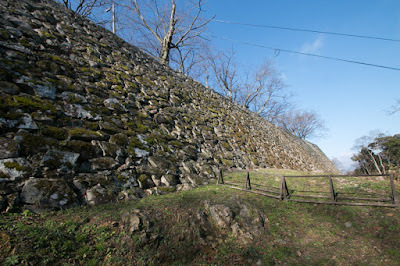 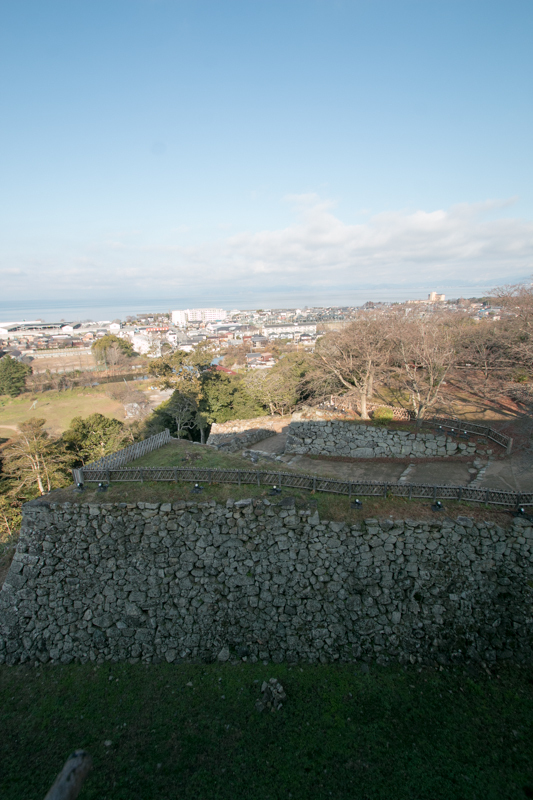 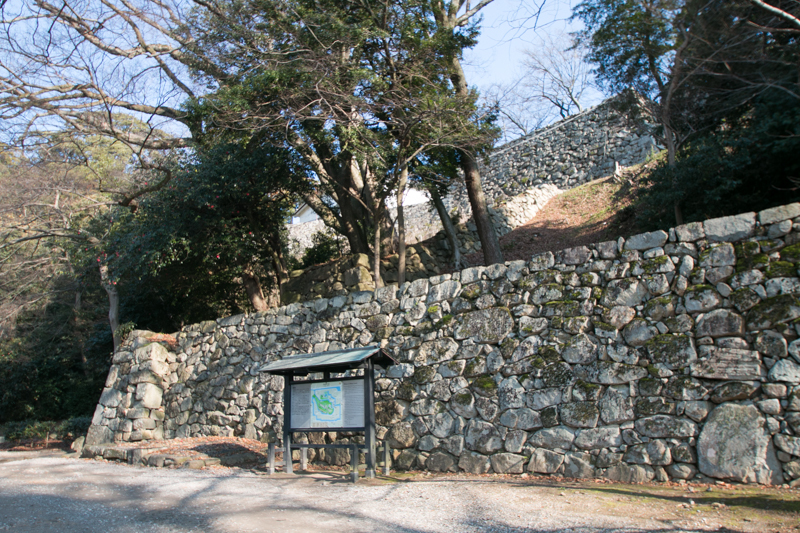 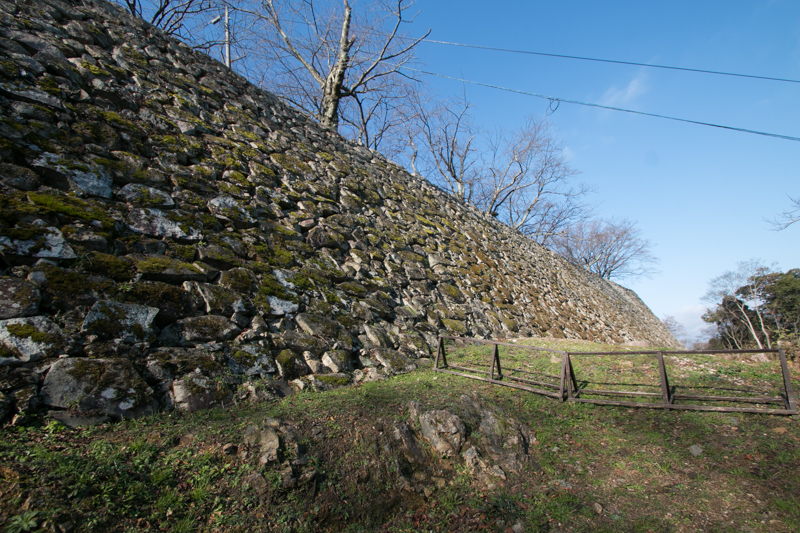 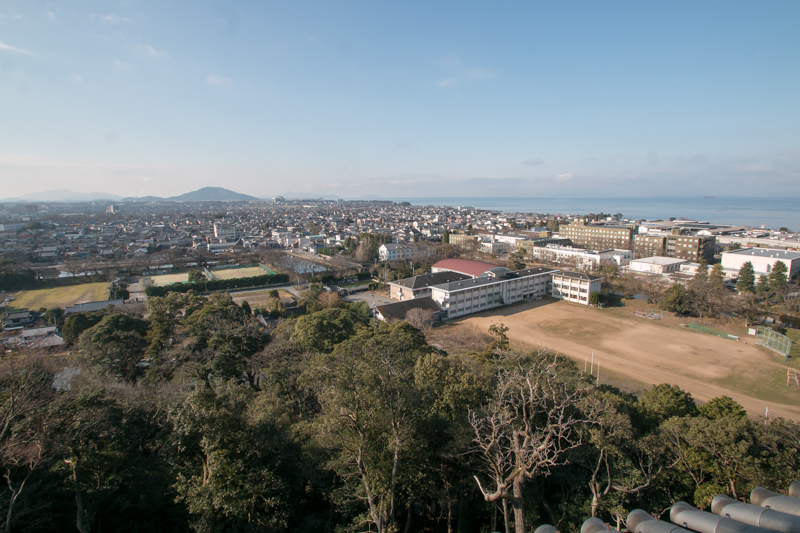 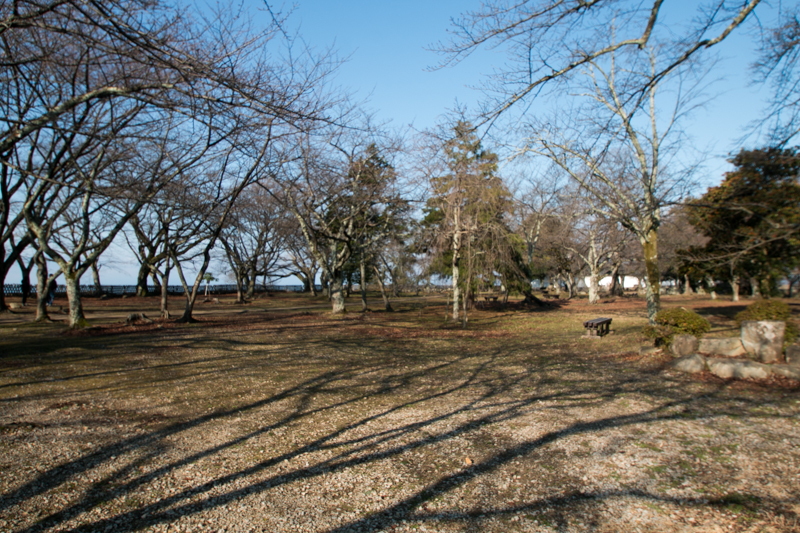 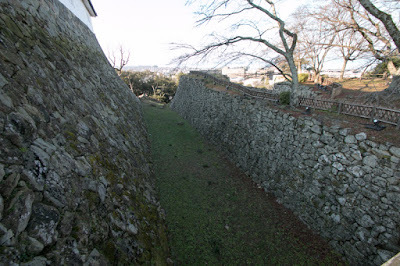 Currently the site of the castle is 1 kilometer apart from Lake Biwako, but this is because of land reclamation, and formerly the hill directly faced lake and north and east side of the castle was surrounded by water. Due to this conditions, except for the fact that the site is surrounded by higher hills near the castle, this location was appropriate to build a castle. 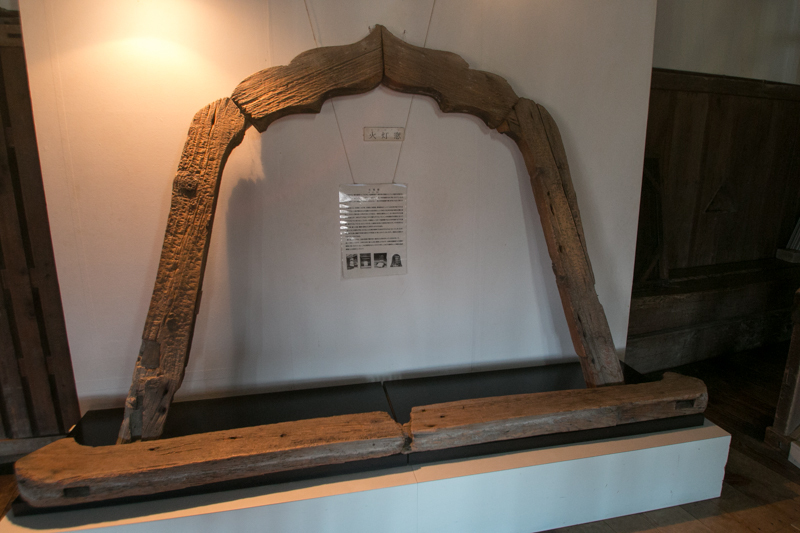 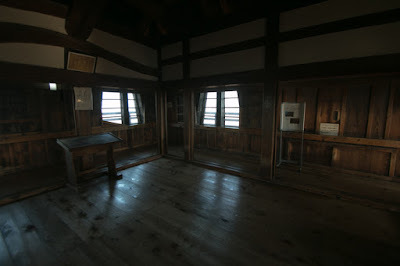 to 1622. 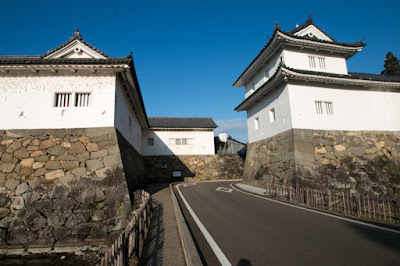 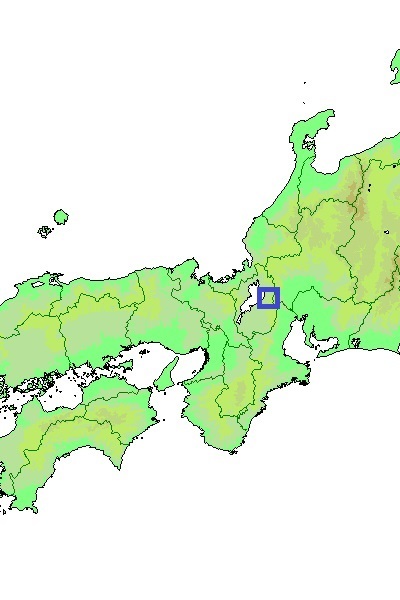 Hikone area is placed at the east end of Omi province (Shiga prefecture), and a narrow path in which Tozando way to eastern region through Mino province (Gifu prefecture) or Hokurikudo way to Hokuriku region go through. 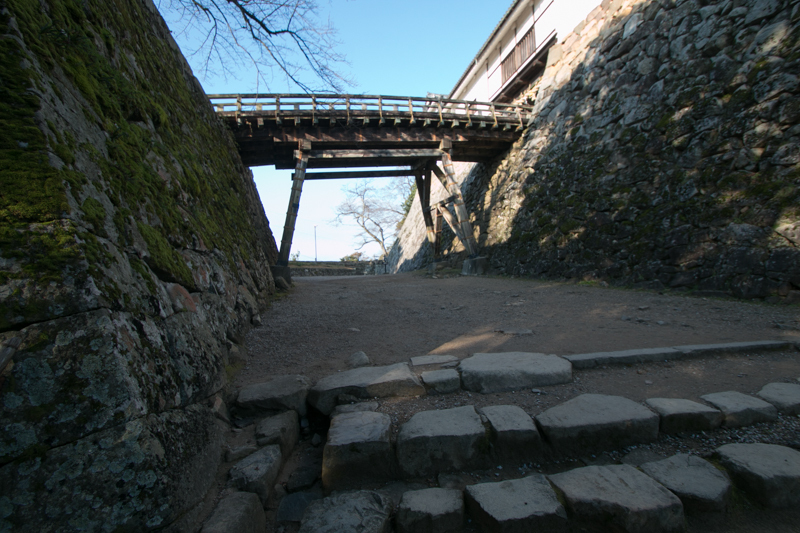 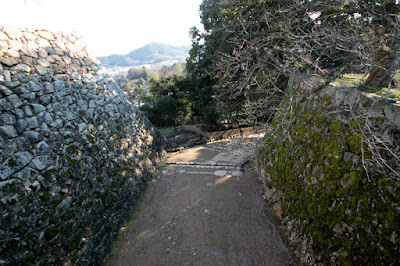 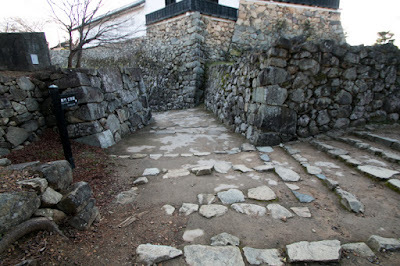 Thus as a eastern gate of Kinki region, this area was vital to rulers at that time. 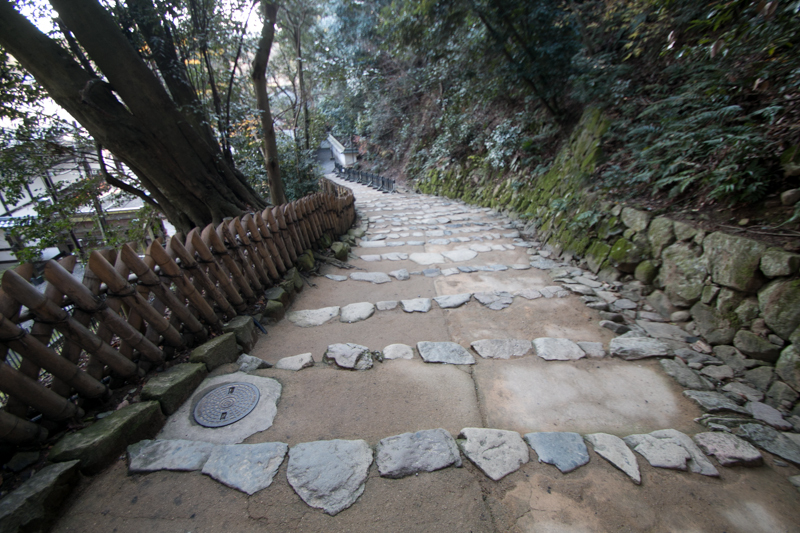 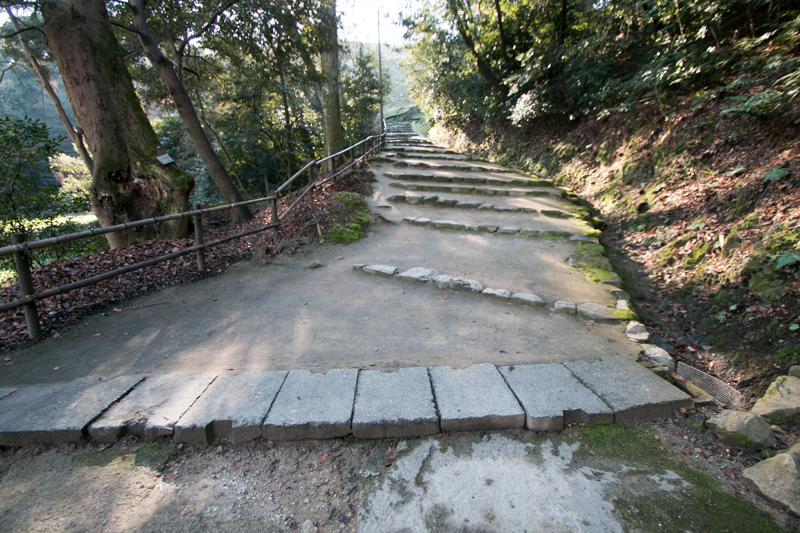 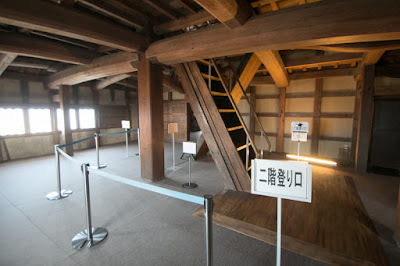 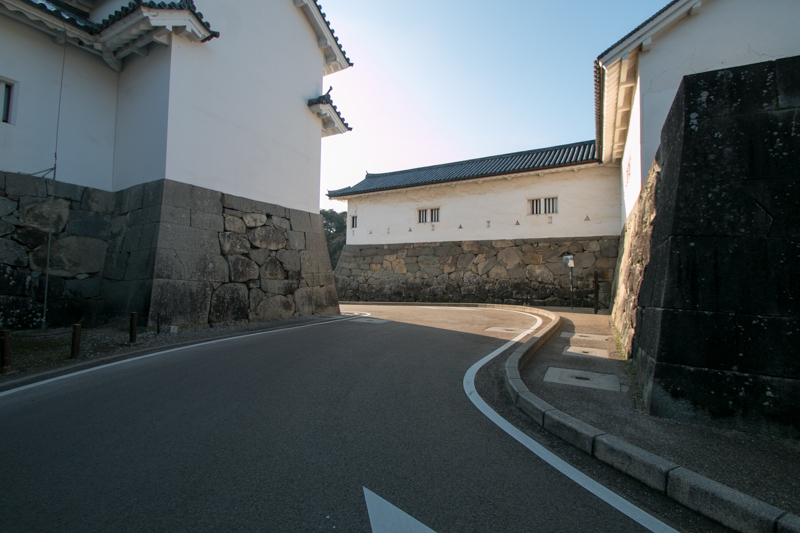 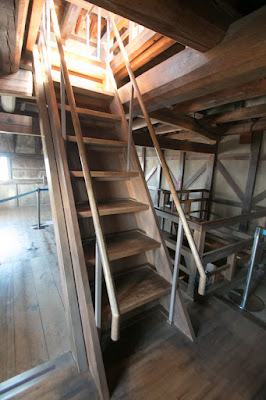 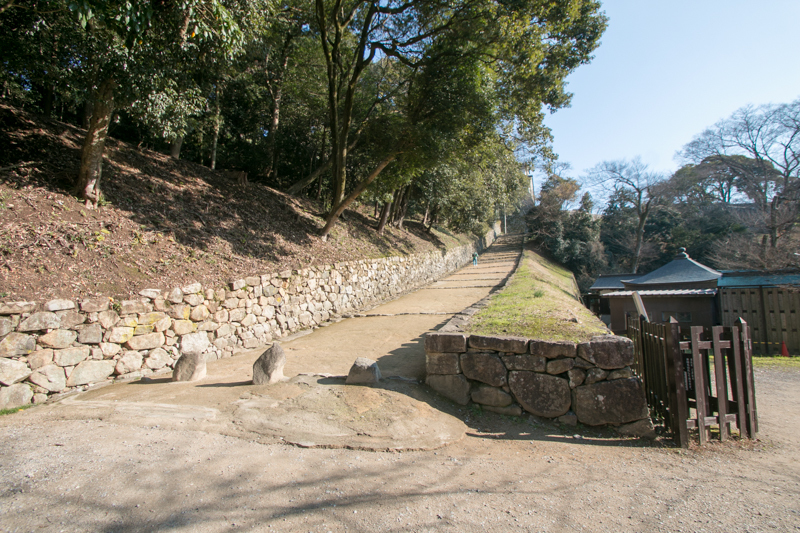 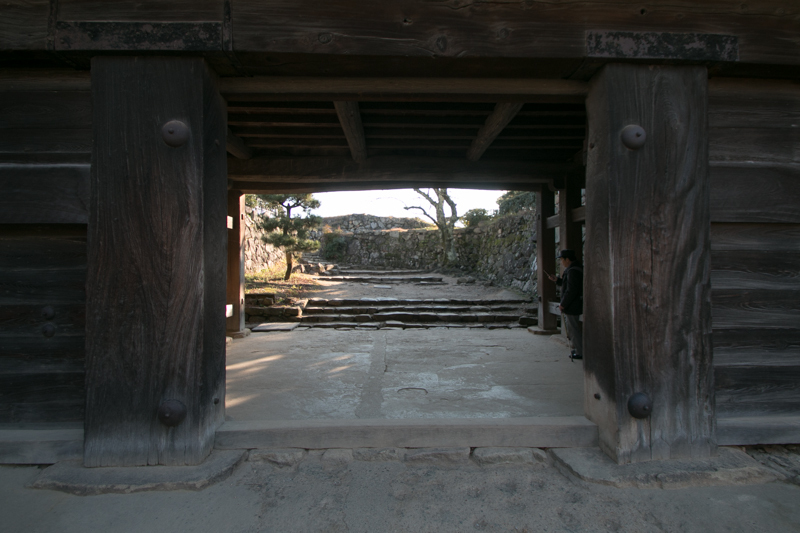 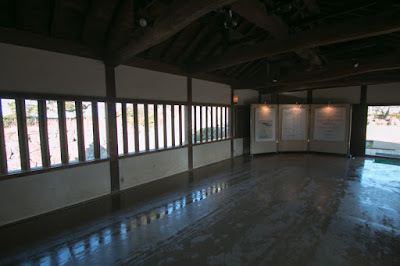 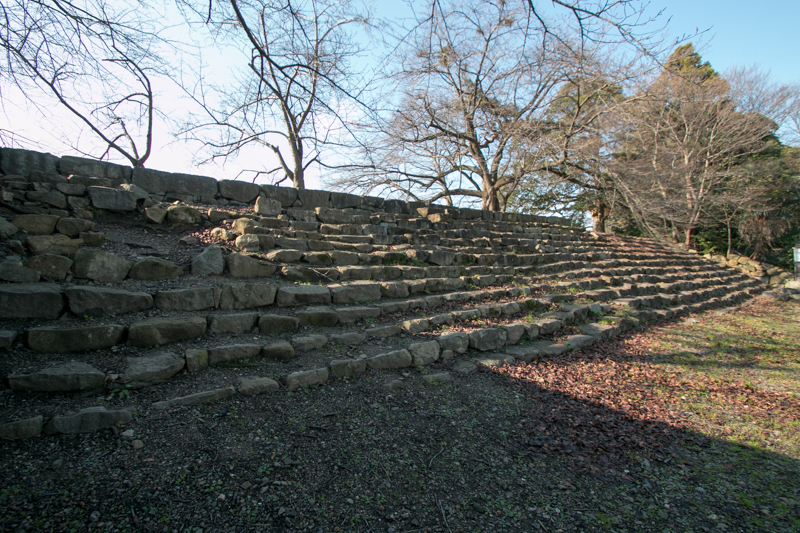 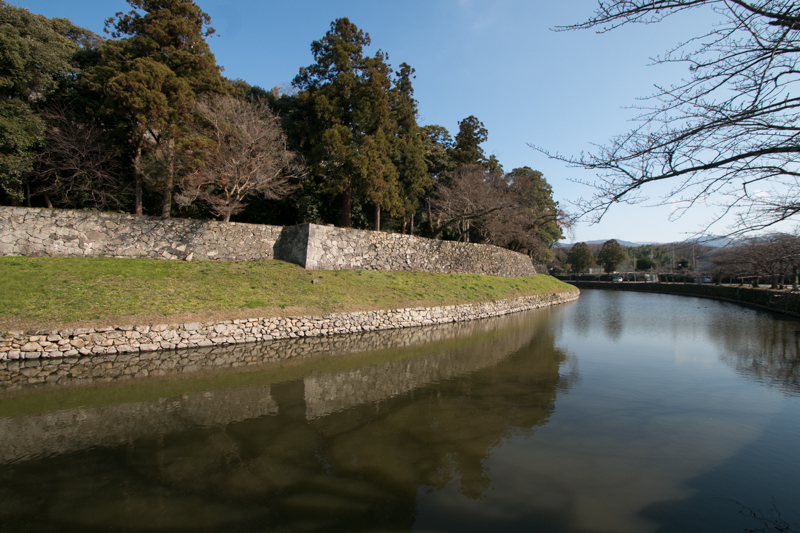 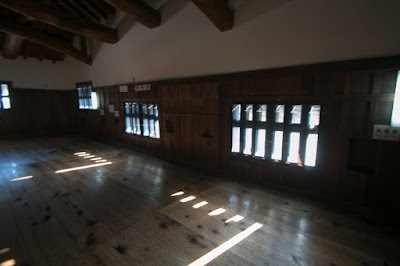 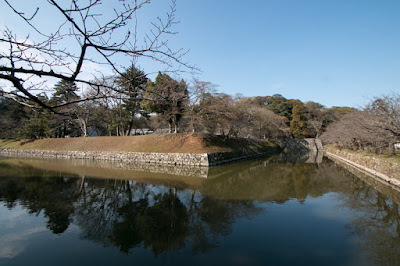 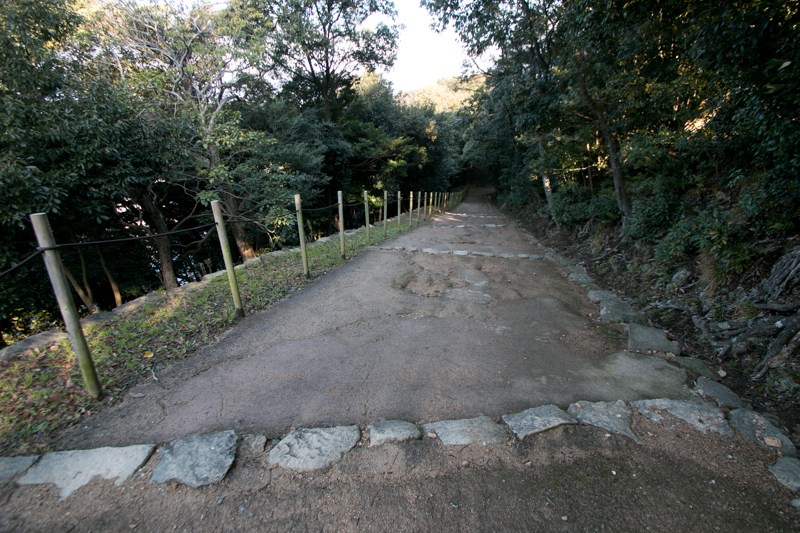 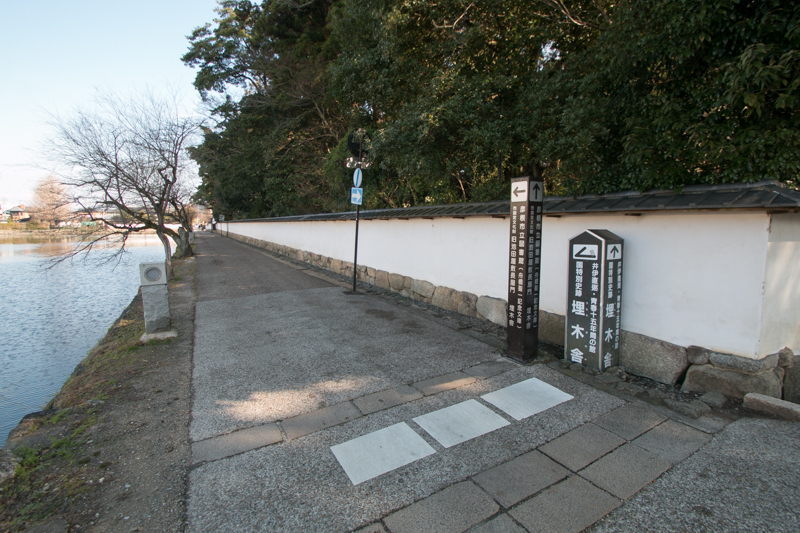 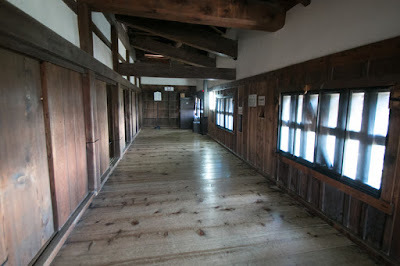 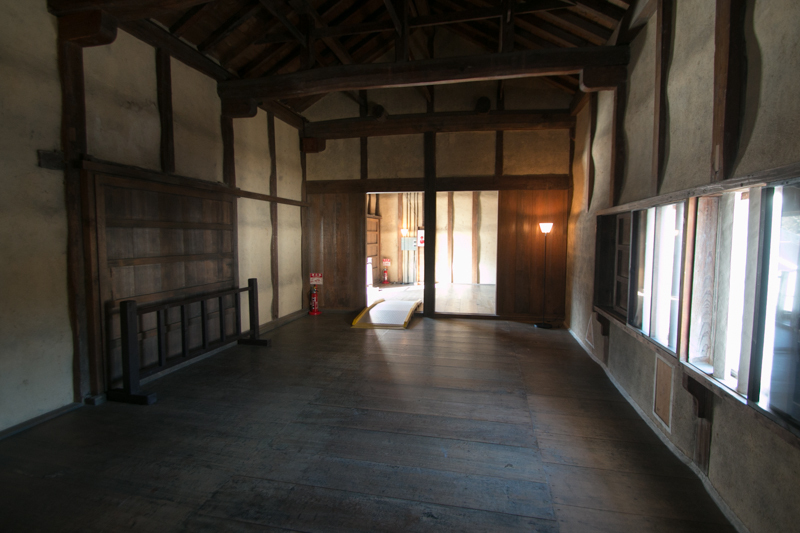 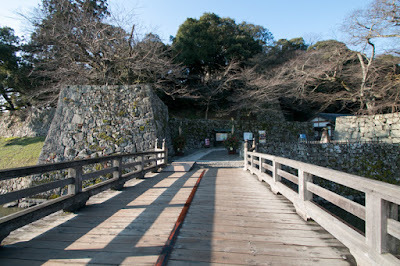 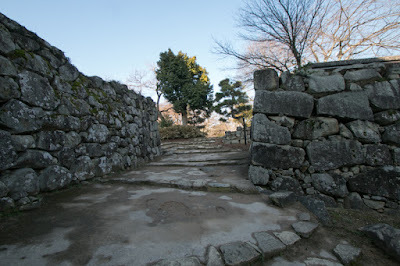 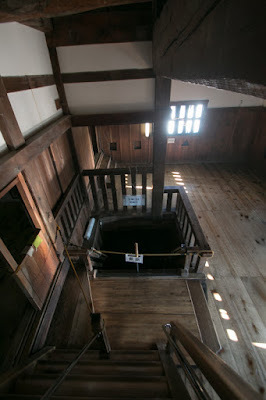 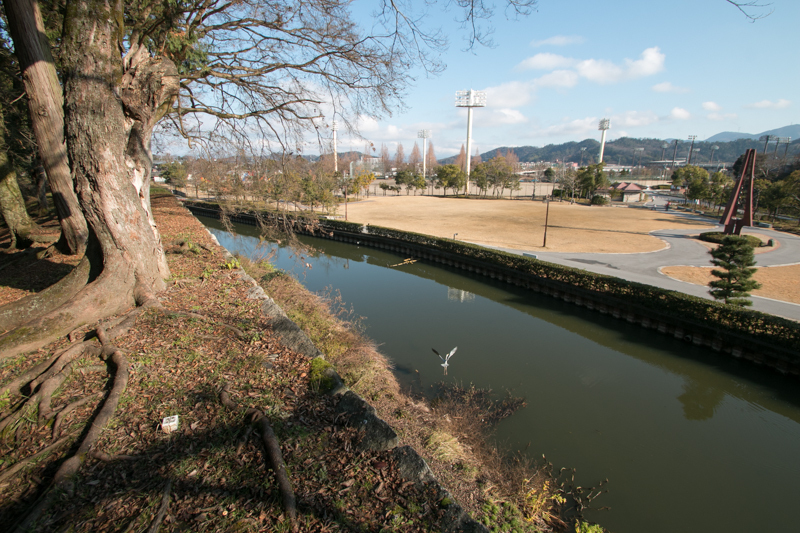 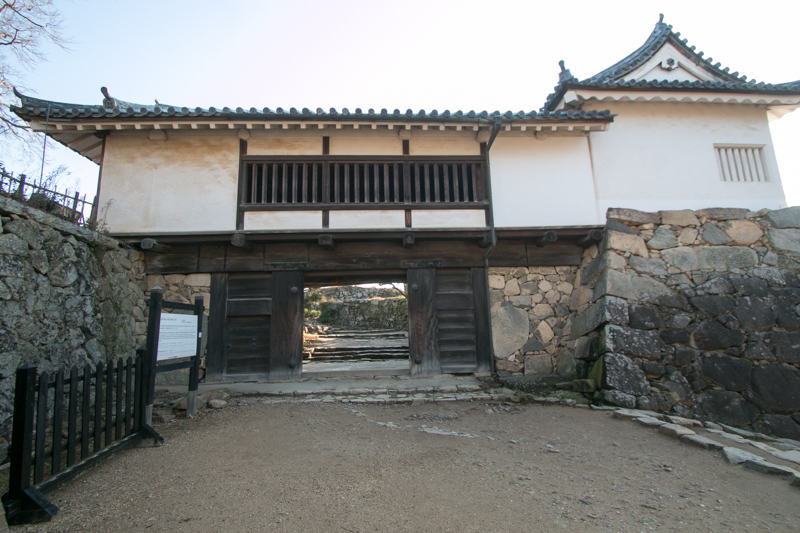 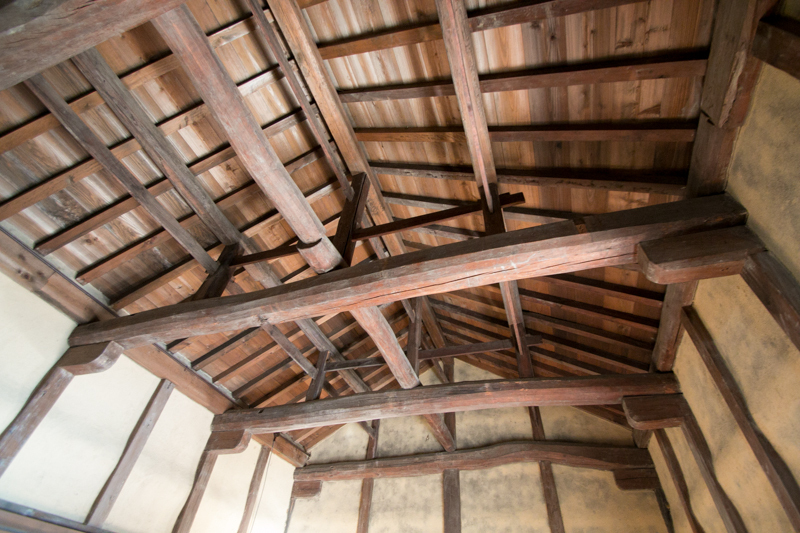 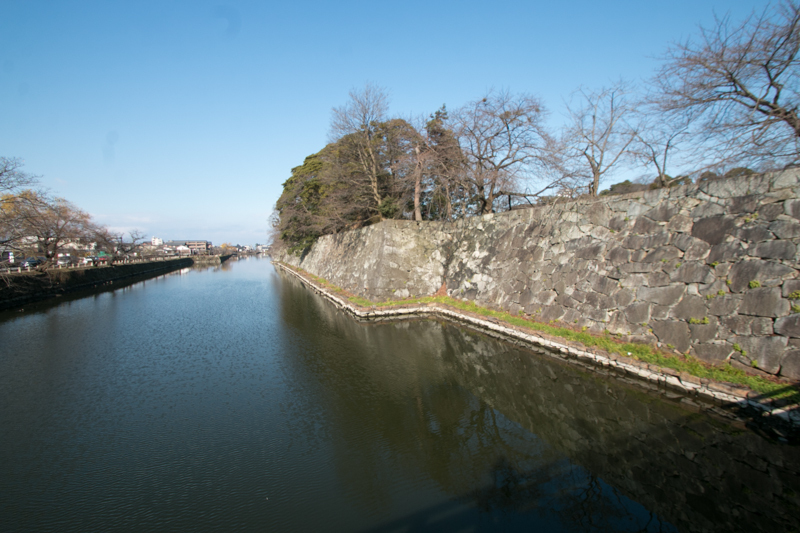 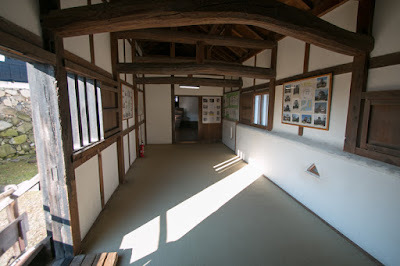 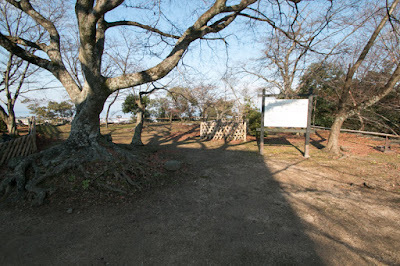 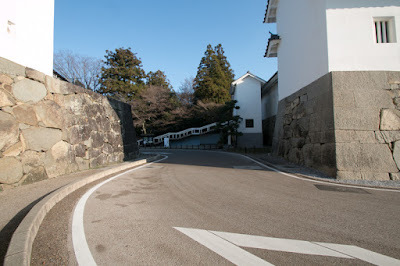 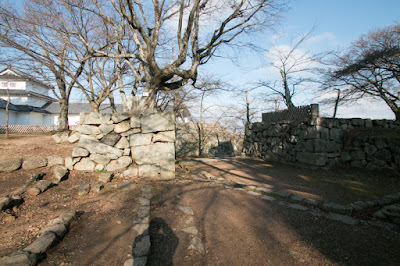 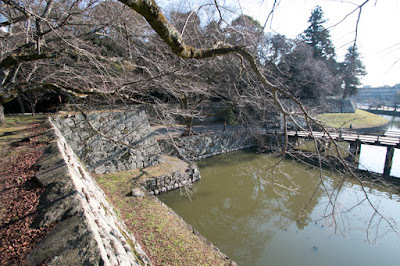 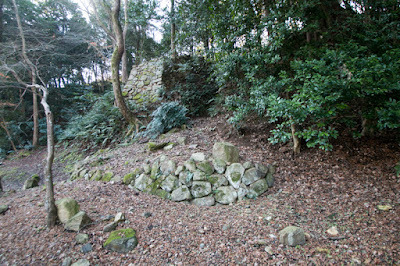 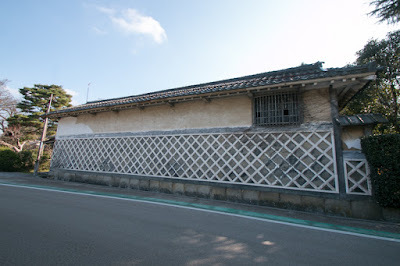 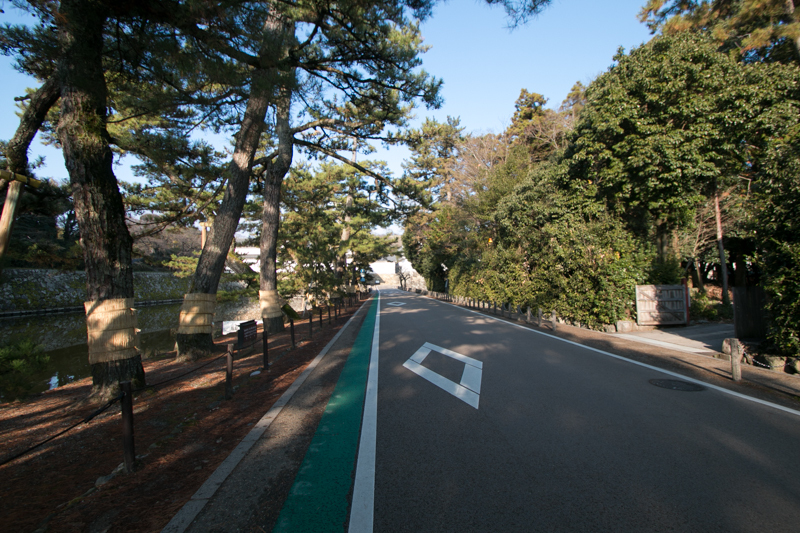 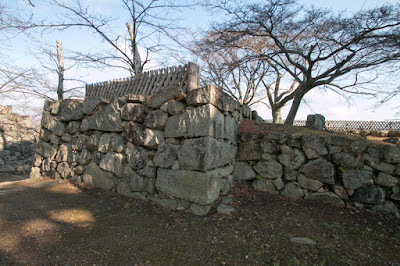 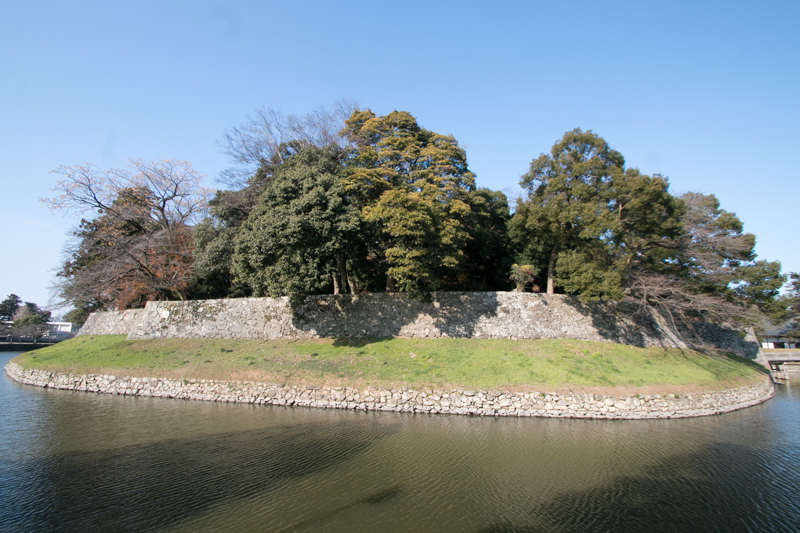 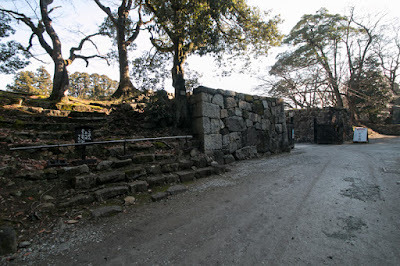 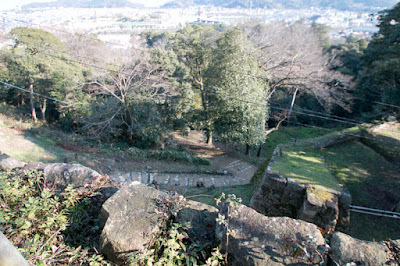 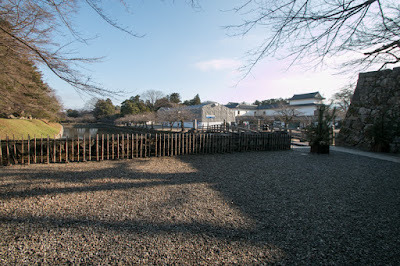 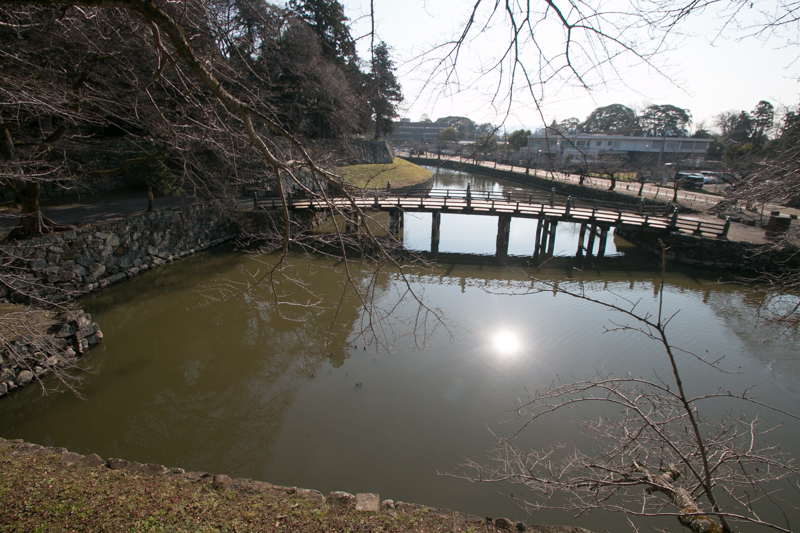 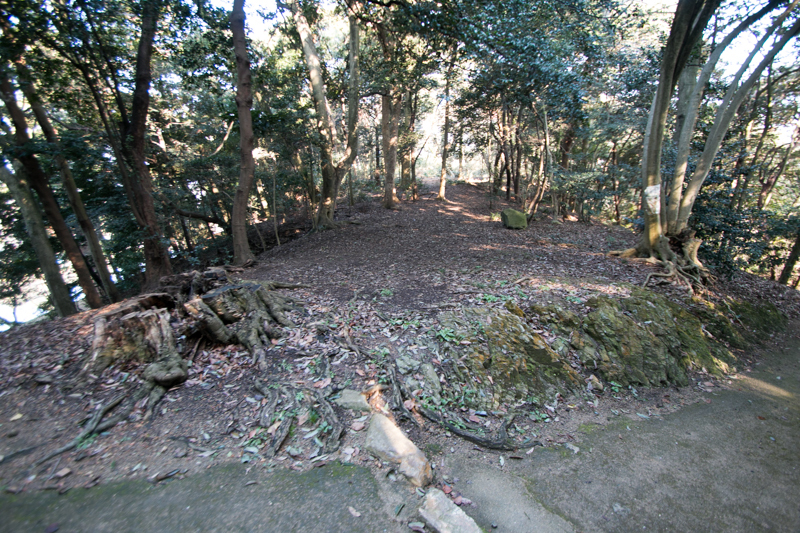 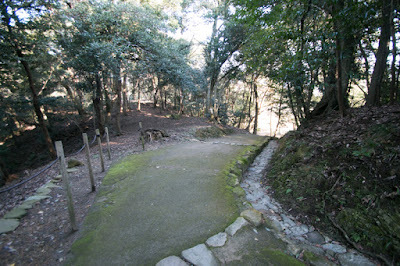 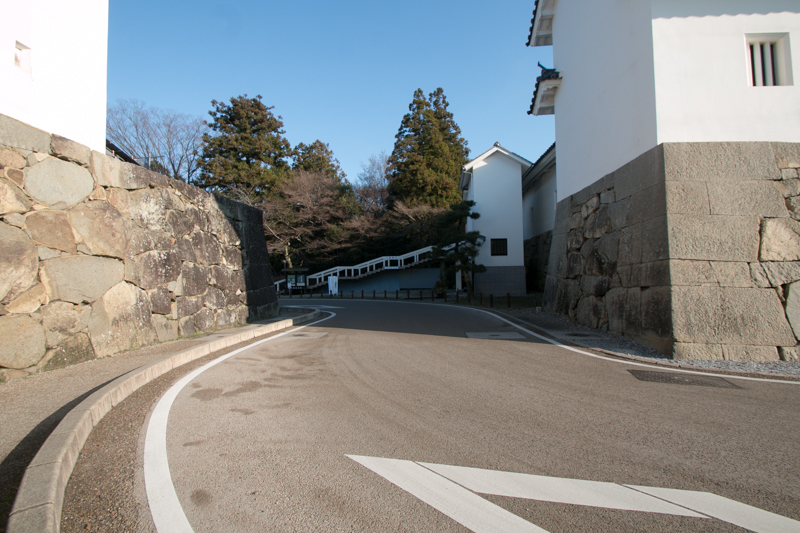 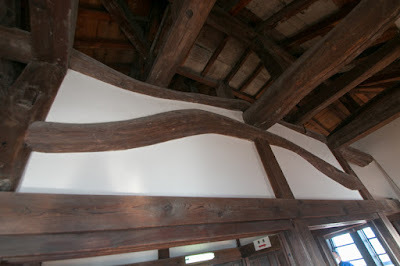 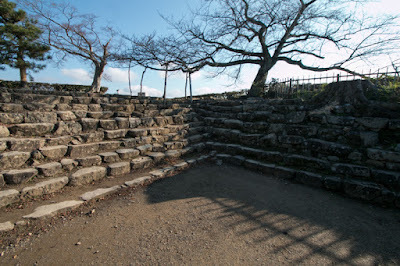 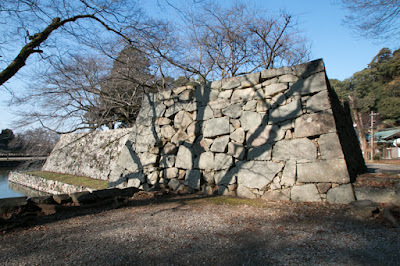 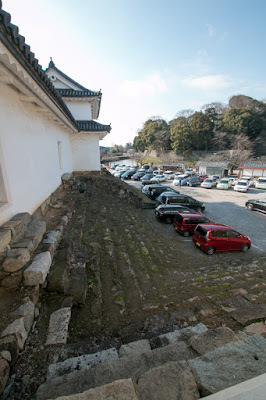 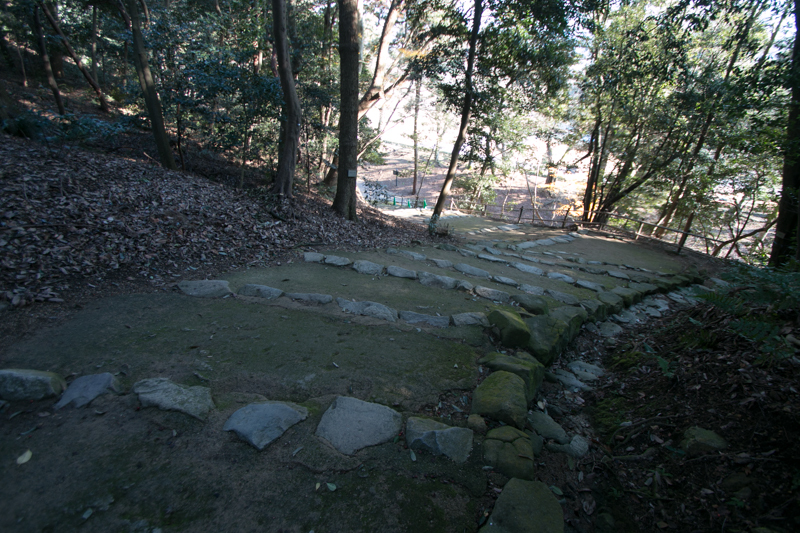 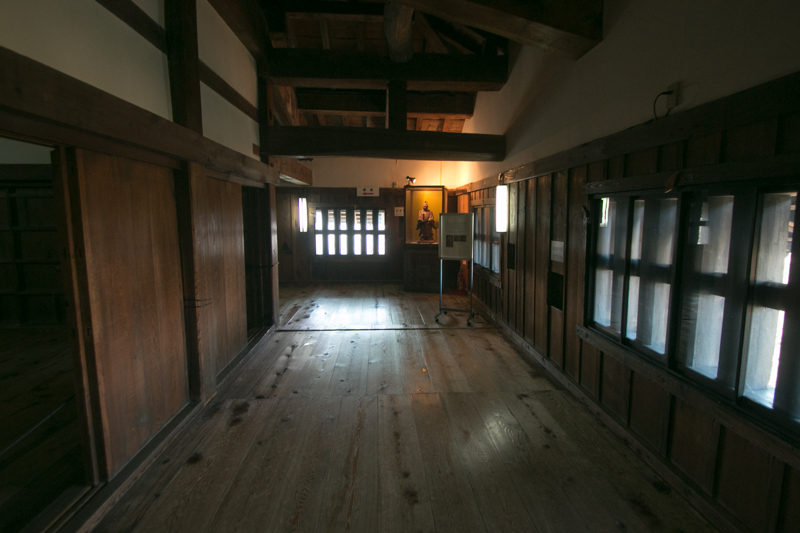 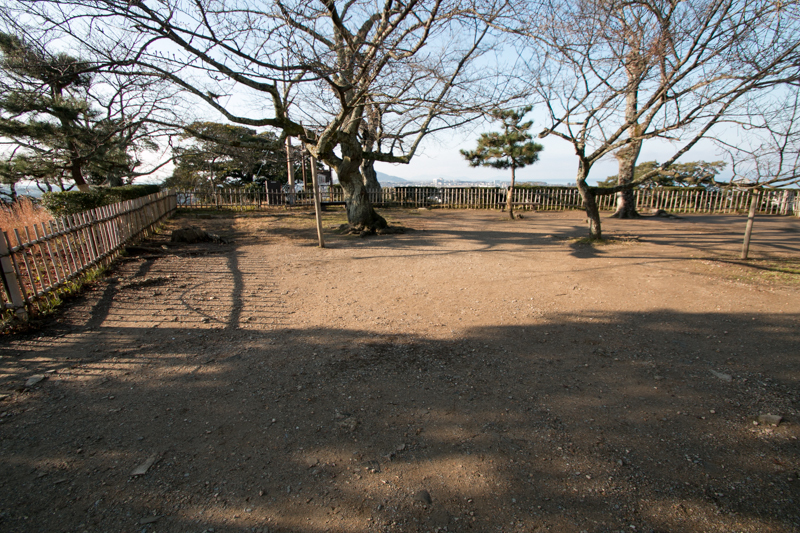 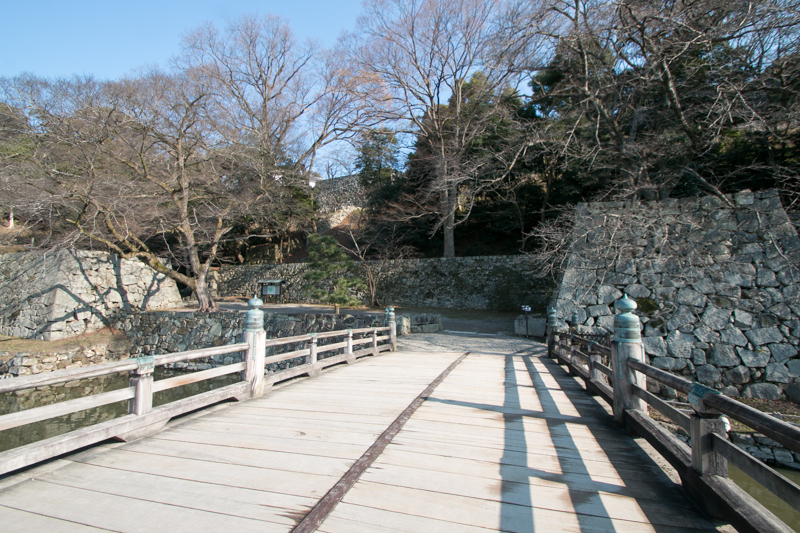 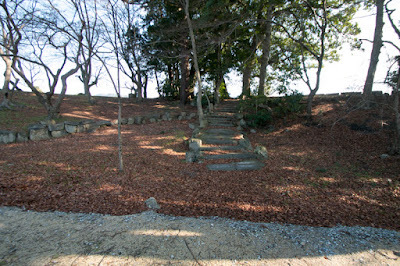 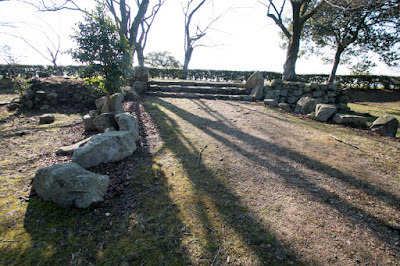 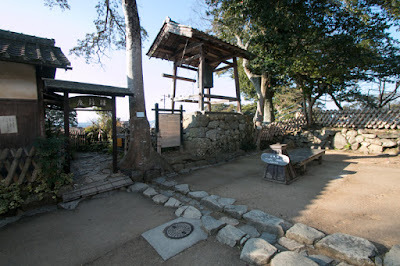 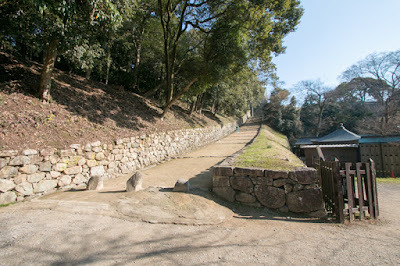 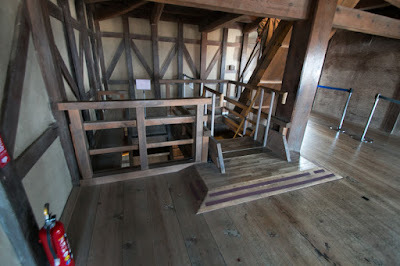 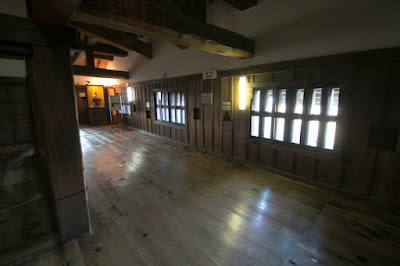 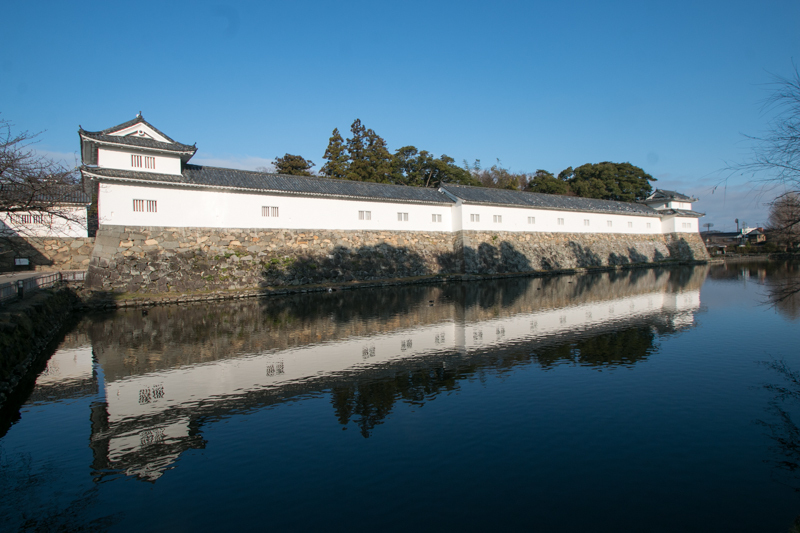 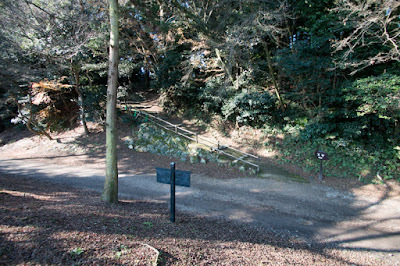 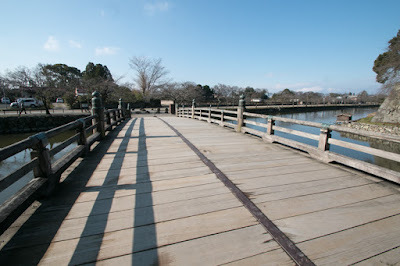 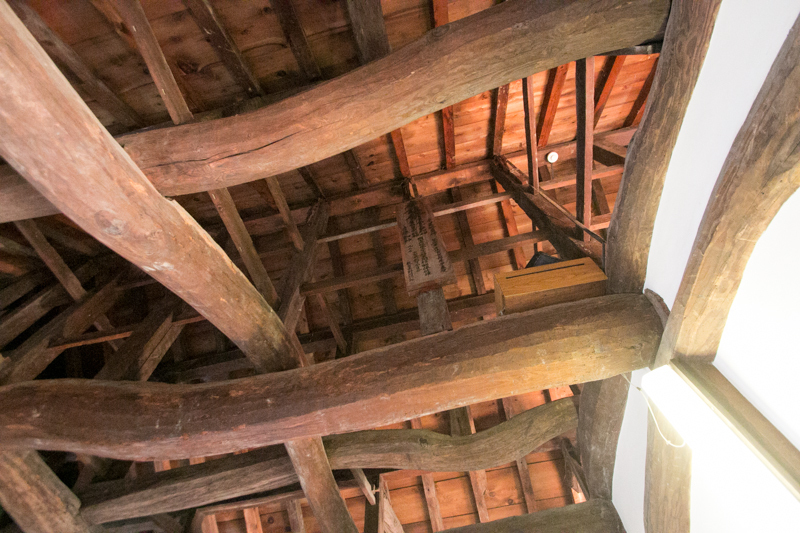 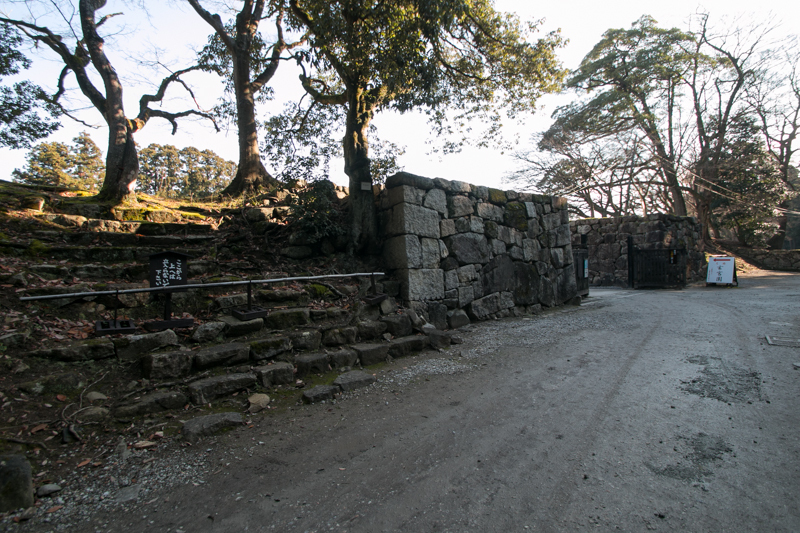 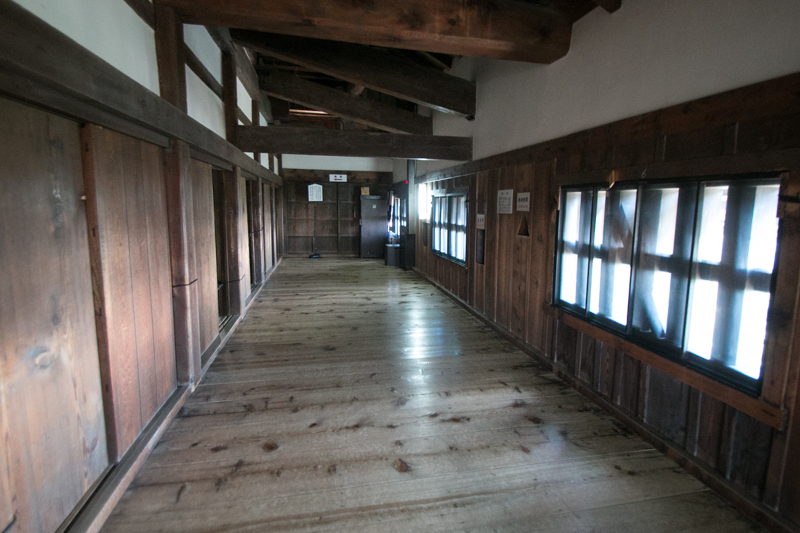 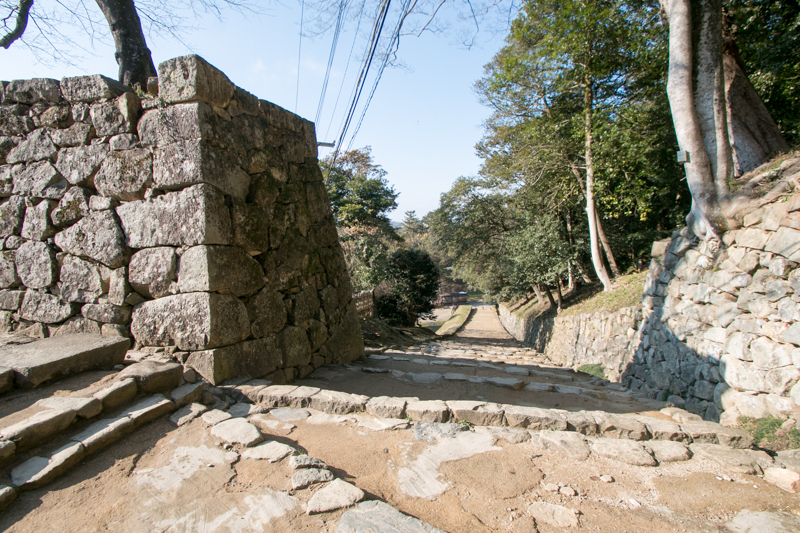 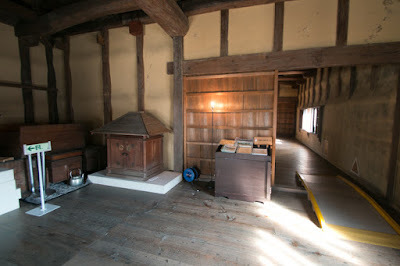 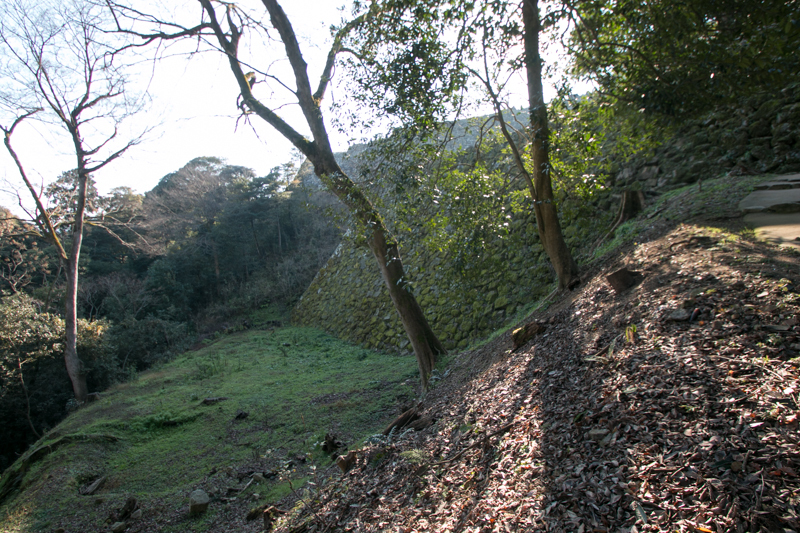 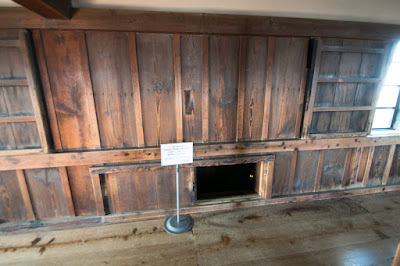 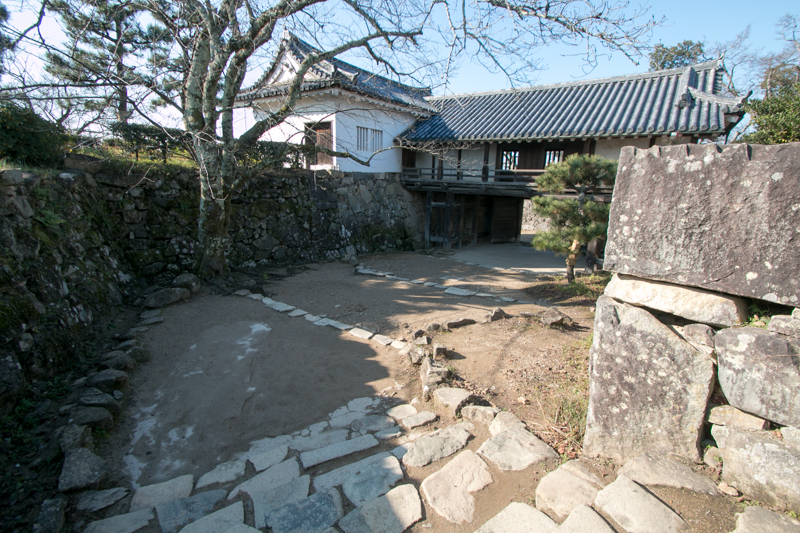 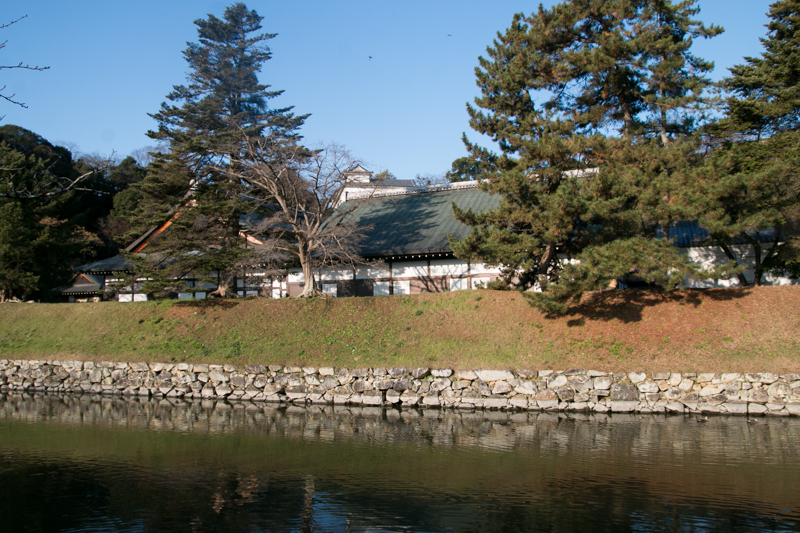 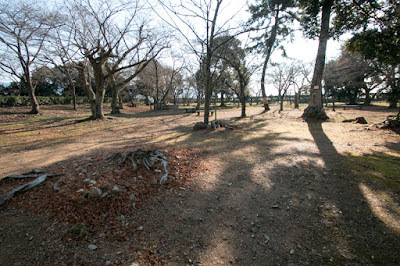 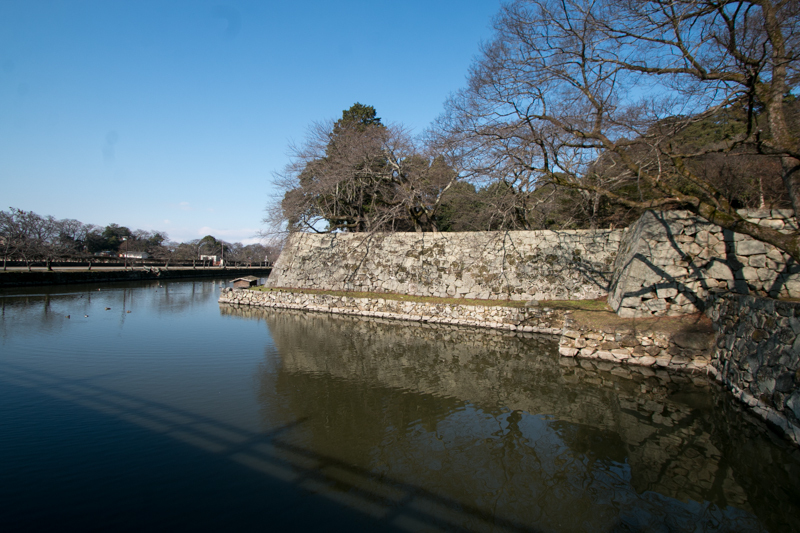 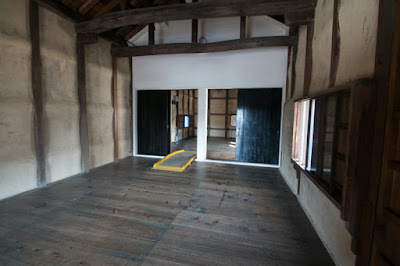 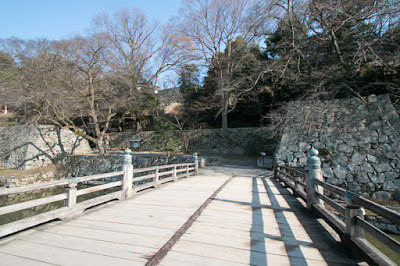 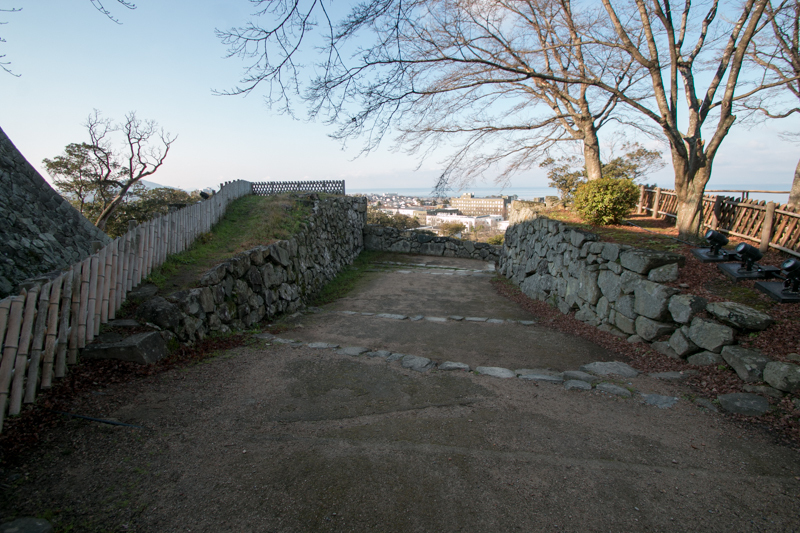 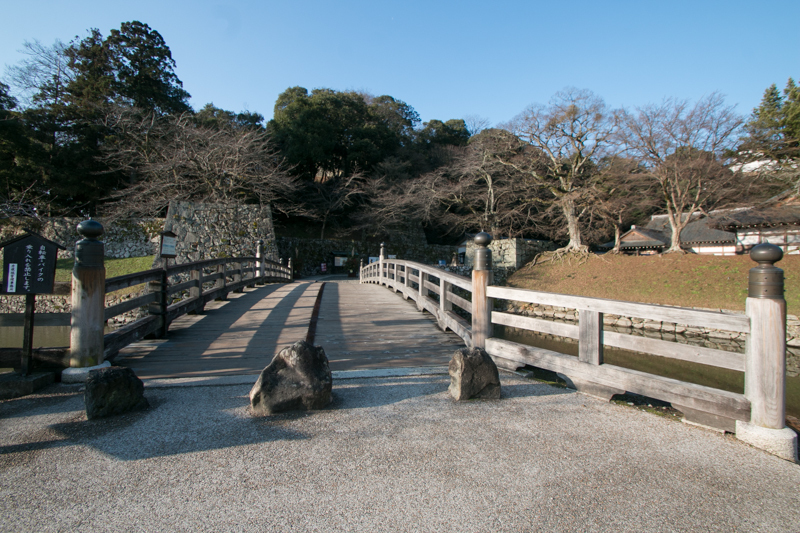 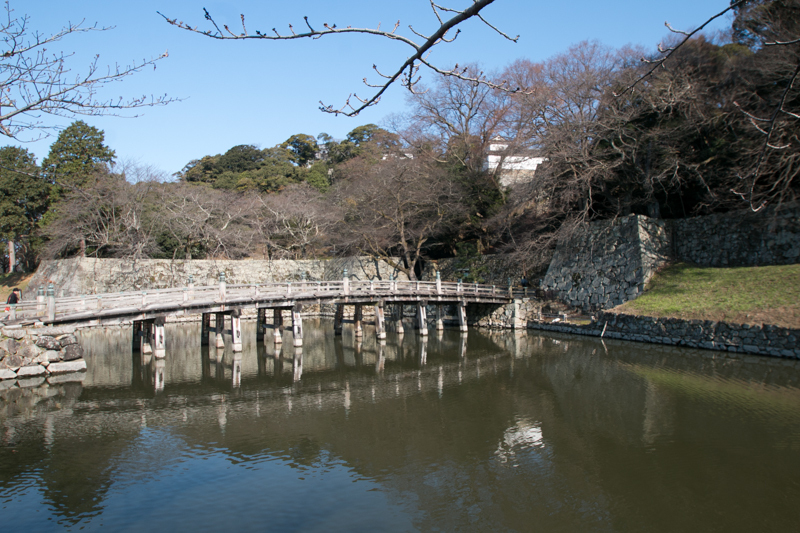 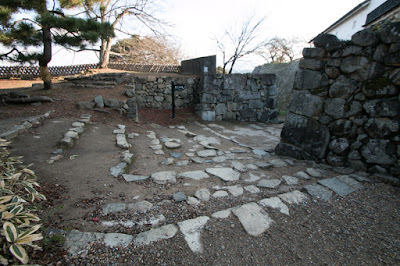 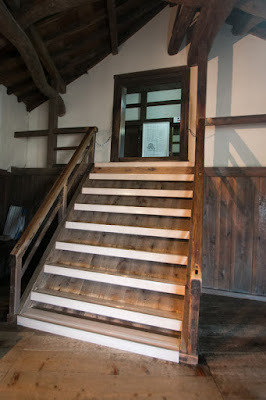 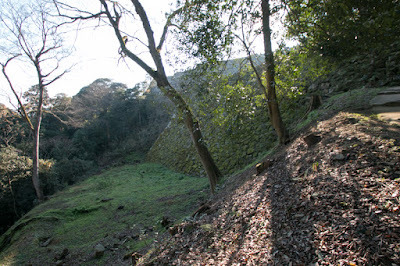 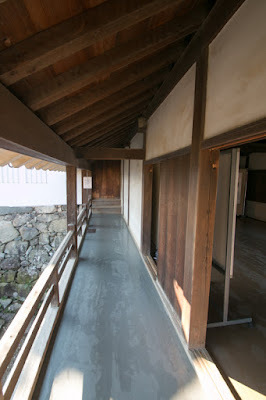 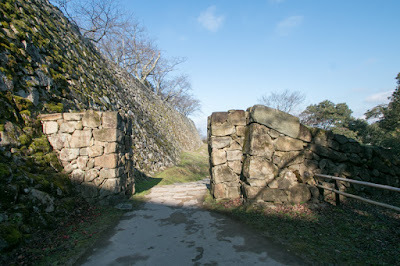 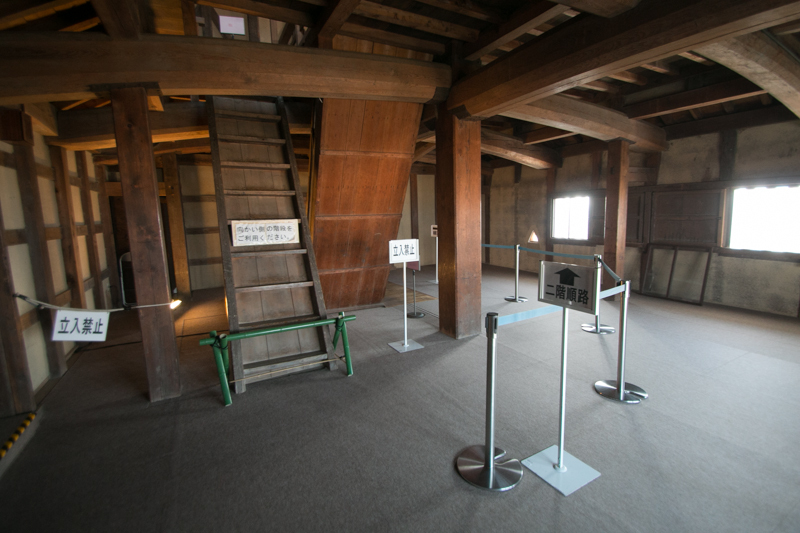 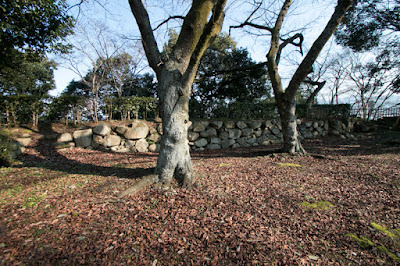 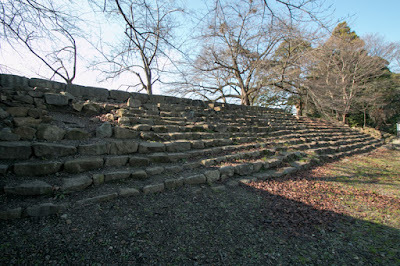 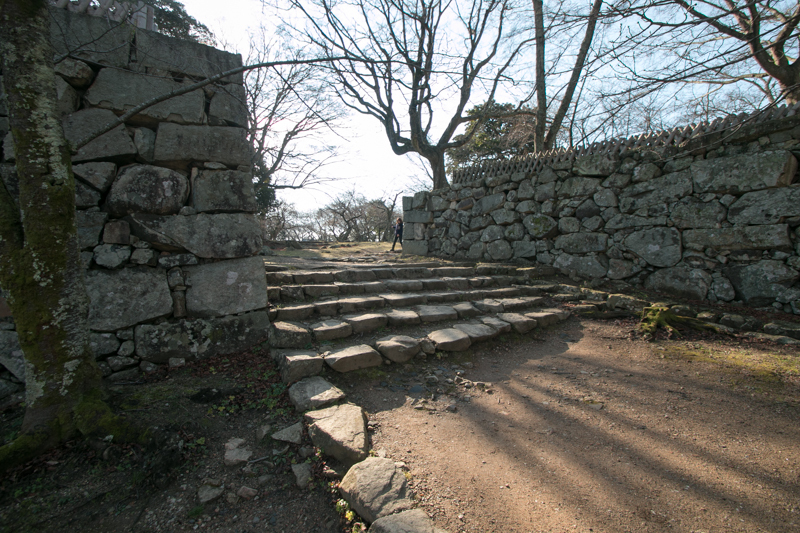 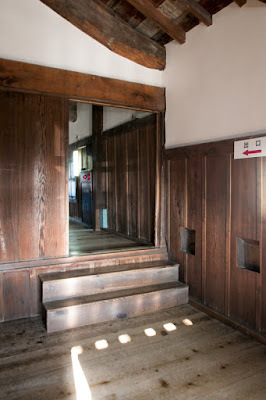 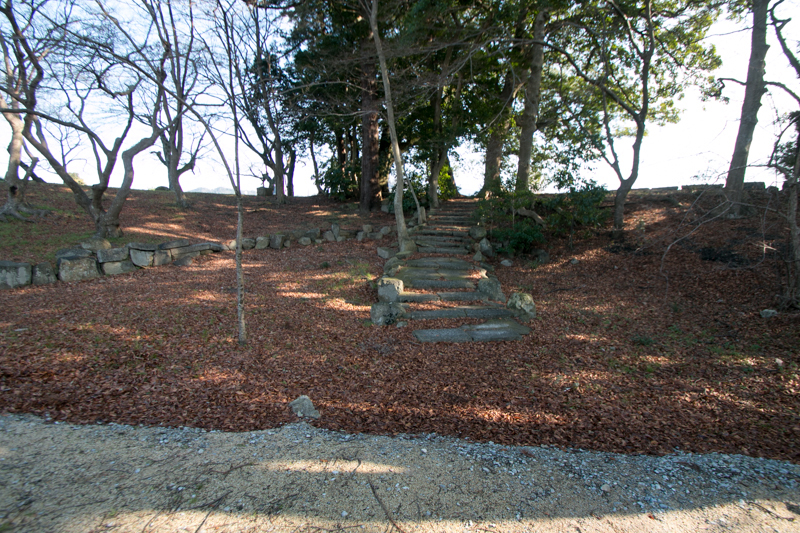 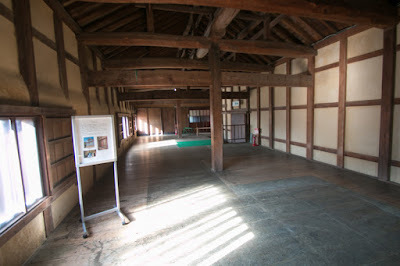 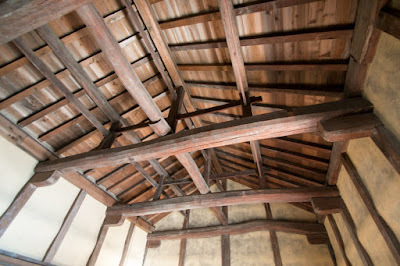 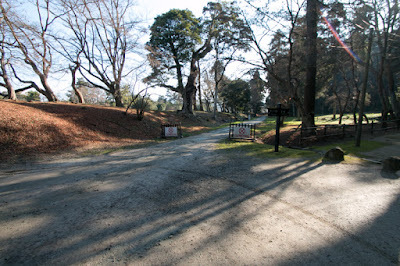 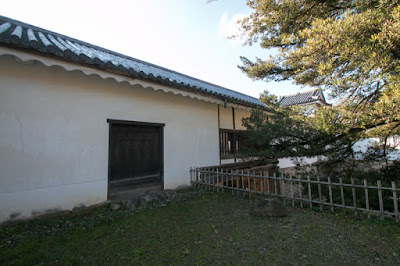 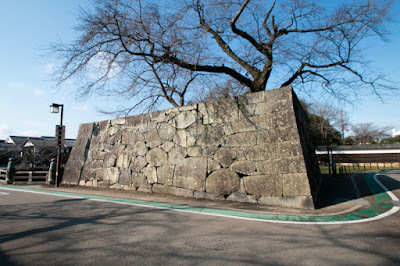 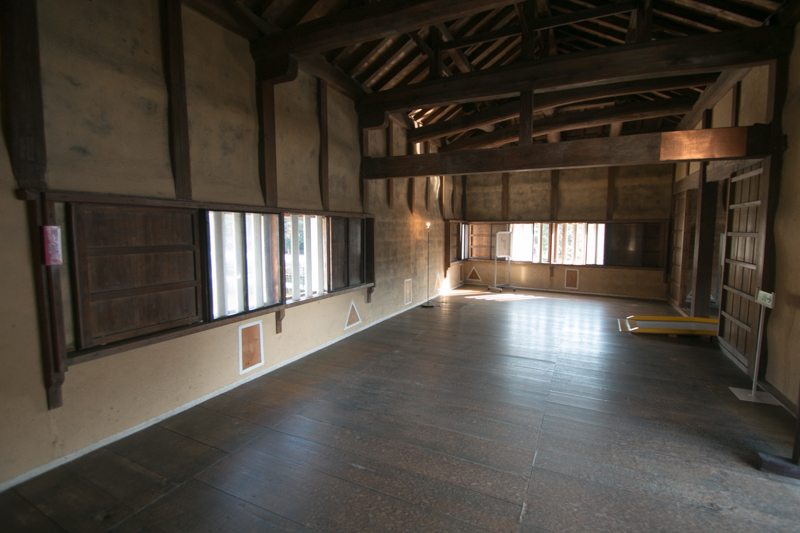 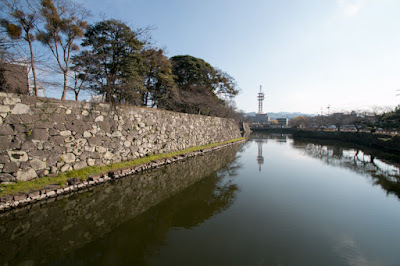 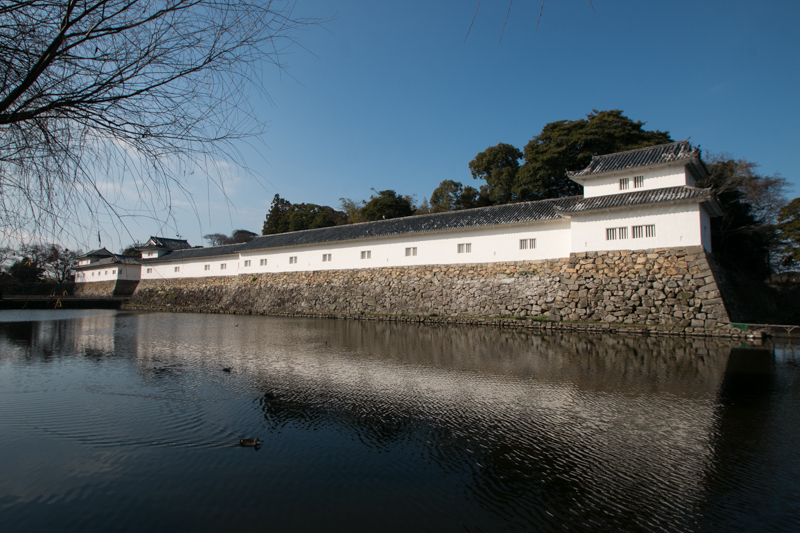 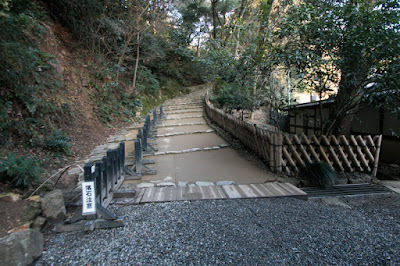 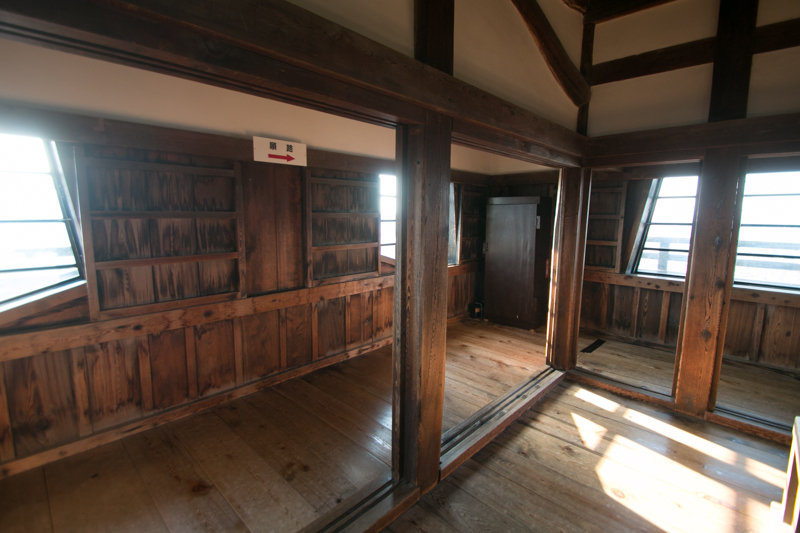 Originally this area was goverend by Sawayama castle, a castle located 2km east of Hikone castle. 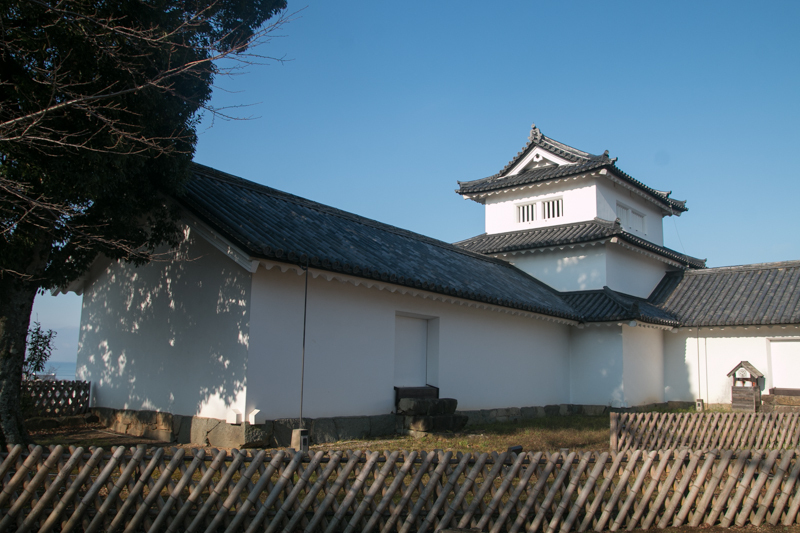 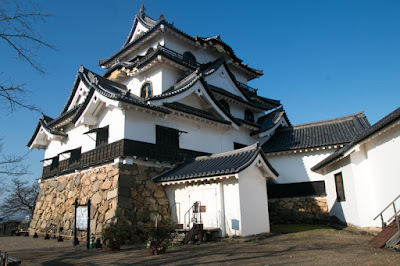 Sawayama castle was originally kept by Azai clan, a warlord of norther Omi country, but once captured by Nobunaga Oda (1534-1582), he appointed Nagahide Niwa (1535-1585), one of his important general, as a commander of the castle. Under Toyotomi government succeeded Nobunga, Hideyoshi Toyotomi (1537-1598) placed Mitsunari Ishida (1560-1600), his chief administrative staff, as a commander of Sawayama castle. 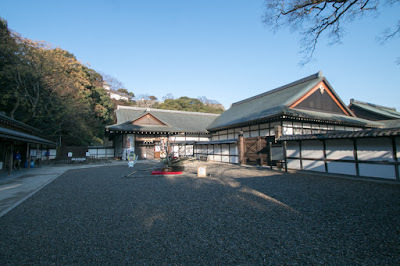 But after the death of Hideyoshi, at the battle of Sekigarara in 1600, Mitsunari was defeated by Ieyasu Tokugawa (1543-1616) and killed, then Naomasa Ii (1561-1602) was appointed as a governor of this area by Ieyasu. 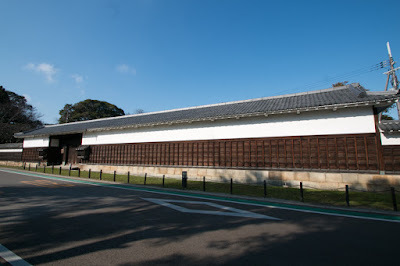 Naomasa Ii was an important general of Ieyasu Tokugawa, and regarded as one of big four in Tokugawa army (other three were Tadatsugu Sakai (1527-1596), Tadakatsu Honda (1548-1610) and Yasumasa Sakakibara (1548-1606)). 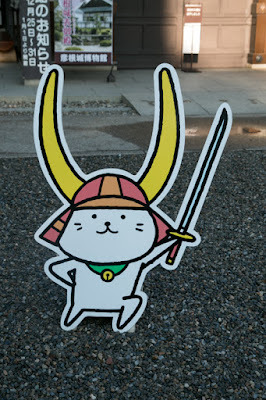 Originally Ii clan was a local small lord of western Totomi province (western part of Shizuoka prefecture) and subordinated to Imagawa clan, a warlord of Suruga province (middle part of Shizuoka prefecture). But when Yoshimoto Imagawa (1520-1560), leader of Imagawa clan was defeated and killed at the battle of Okehazama in 1560, Ii clan attempted to leave Imagawa clan but was suppressed. Ii clan was once forced to the corner of extinction and young Naomasa wandered. Later grown up Naomasa was hired by Ieyasu Tokugawa, a warlord of Mikawa province (eastern part of Aichi prefecture) who captured Totomi province in 1568. 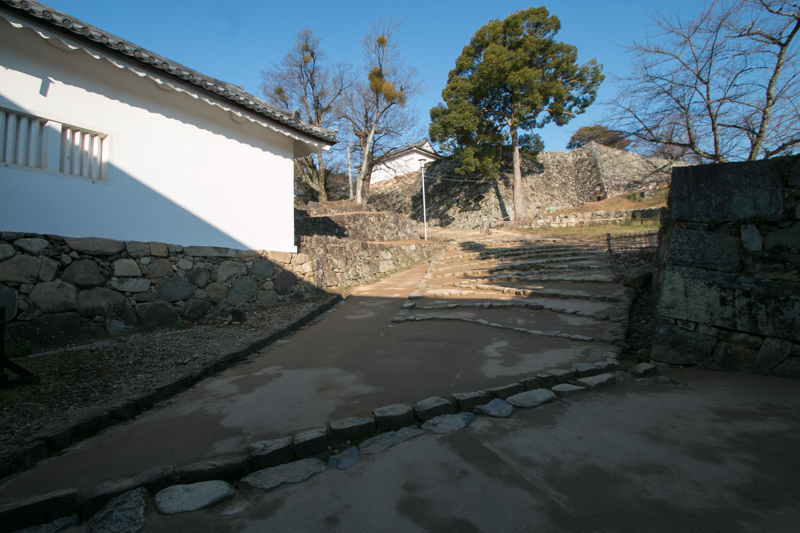 At first Naomasa served a page to Ieyasu, but after growth Naomasa became a general and distinguished himself lead the army. Especially, when Ieyasu captured Kai province (Yamanashi prefecture) formerly held by Takeda clan, Naomasa well worked for inviting former Takeda retainers and contributed to seizing Kai province. 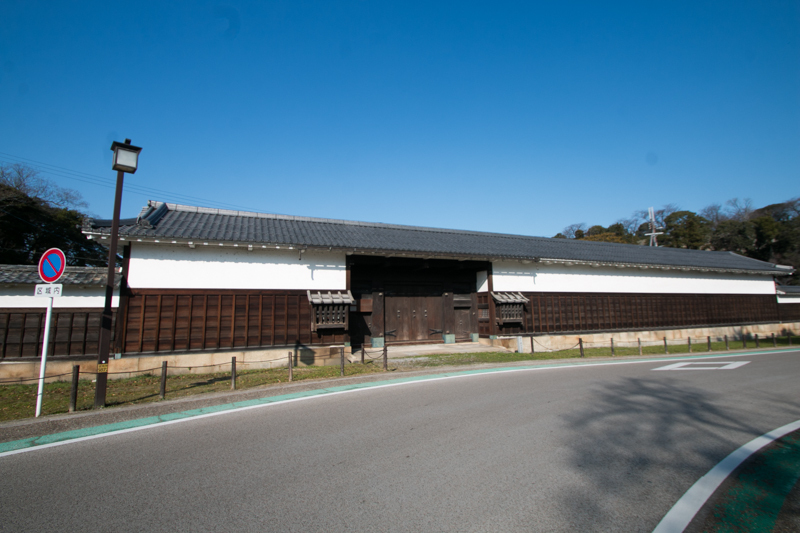 At that time red color armored army which was famous as its braveness under Masakage Yamagata (1529-1575), former Takeda general, was attached to Naomasa by Ieyasu. 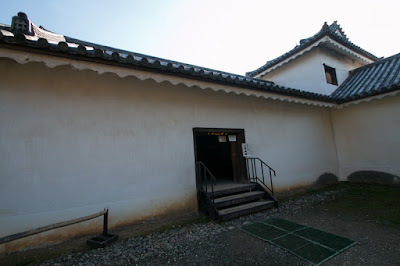 Naomasa also contributed to make peace with Hojo clan, a large warlord of Kanto region which also aimed at Kai province, in inferior situation. Due to his talent in tactics and diplomacy, and above achievements, Naomasa was highly trusted by Ieyasu and became one of the most important generals of Tokugawa army. 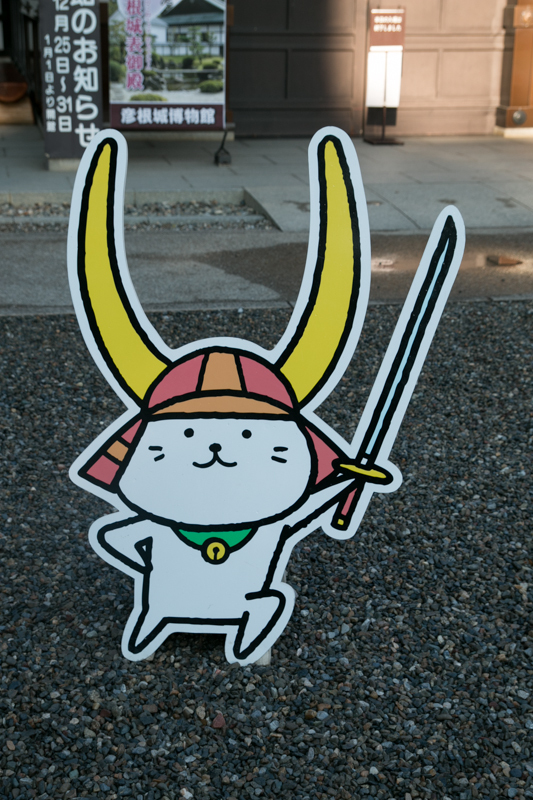 Naomasa lead his army and charged into enemies with his spear at many battles, and was feared by "Red devil". 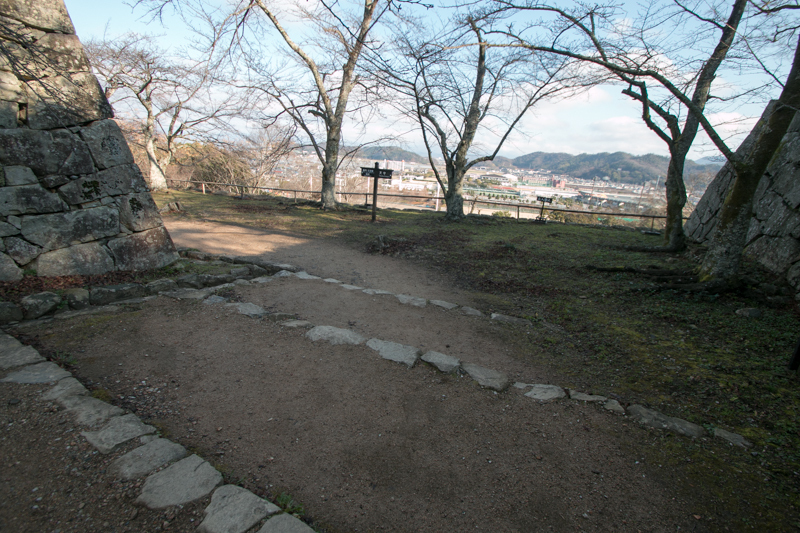 Not only Ieyasu, Hideyoshi Toyotomi (1537-1598), the rival of Ieyasu and ruler at that time, also praised Naomasa. 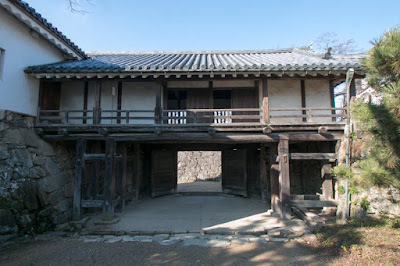 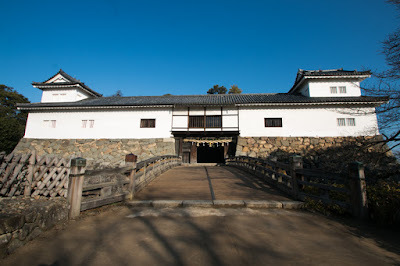 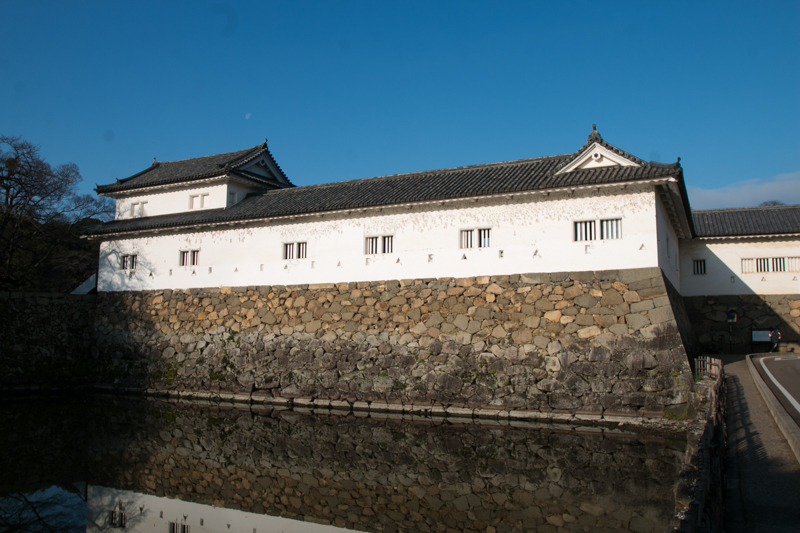 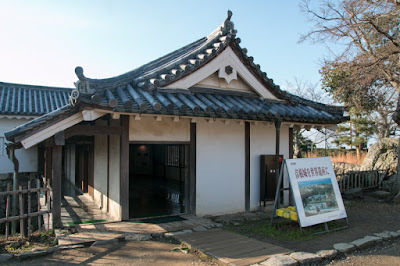 In 1590, when Ieyasu was transferred to Kanto region by Toyotomi government, Naomasa was appointed as a commander of Minowa castle (Gunma prefecture), a strategic position of north Kanto area. Later Naomasa newly built Takasaki castle and moved there. 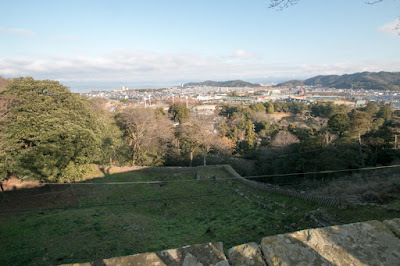 After the death of Hideyoshi, Naomasa contributed to inviting other lords to Tokugawa side before the battle of Sekigahara against Toyotomi supporting lords lead by Mitsunari Ishida, and during the battle itself he attacked the enemy as a vanguard at the very beginning of the battle. Naomasa fought a fierce battle, but at the last stage, during the chase against Yoshihiro Shimazu (1535-1619) who was retreating by breaking through of Tokugawa troops from front side, he was shut by suicide corps of Shimazu clan and caused deep wound. 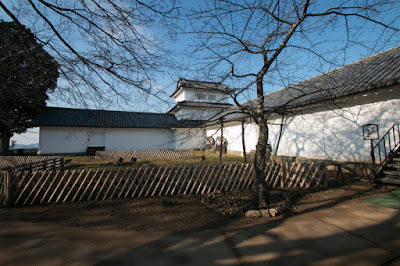 After the battle, Naomasa was praised for his preparatory operations and achievement in the battle and got largest territory among Tokugawa generals at Omi province. 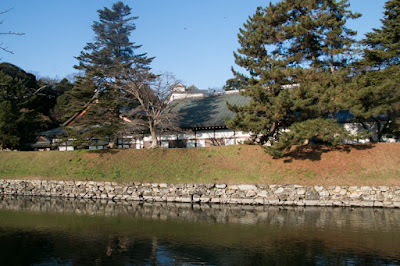 Of course this place was the forefront against Toyotomi clan still existed at Osaka castle or former Toyotomi related lords placed at western Japan. 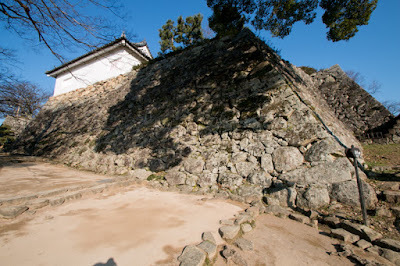 At first Naomasa used Sawayama castle. 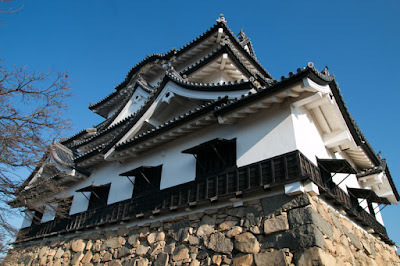 But even through it was reformed, Sawayama castle was an old style castle on the high mountain and it was difficult to make an effective counterattack as it was divided into hilltop and hillside area. 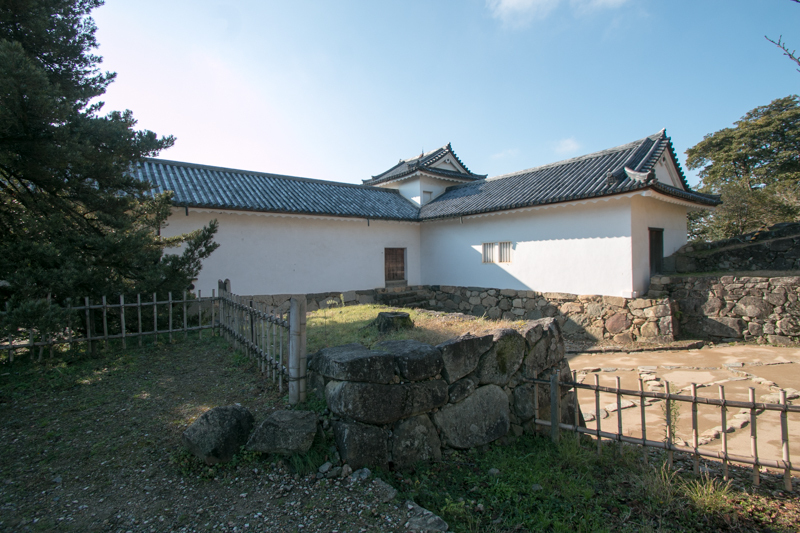 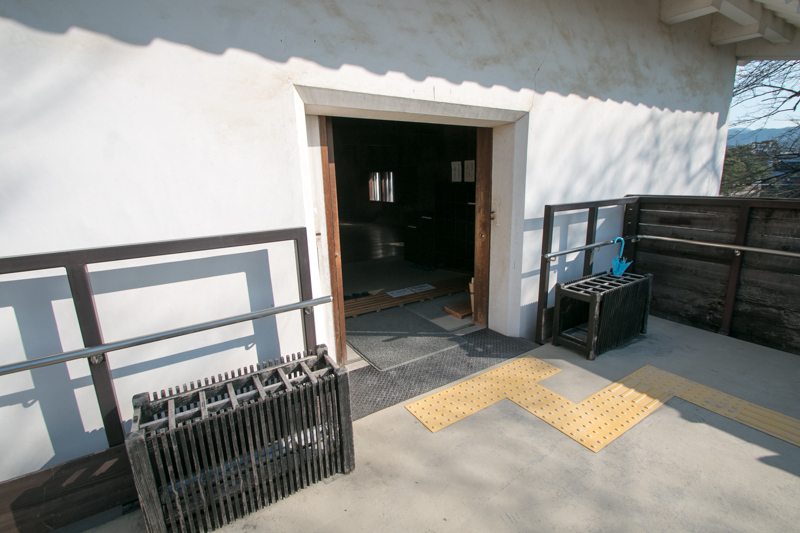 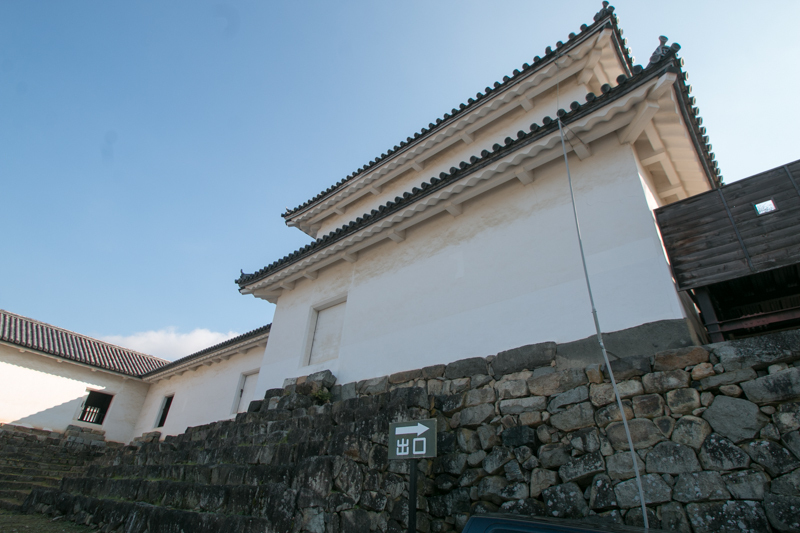 In addition to this, Sawayama castle was a castle of Mitsunari Ishida, the leader of enemy at Sekigahara and chief administrative staff of former government, and there was necessity to erase the image of Mitsunari. Due to such reasons, Naomasa decided to abolish Sawayama castle and build a new castle. 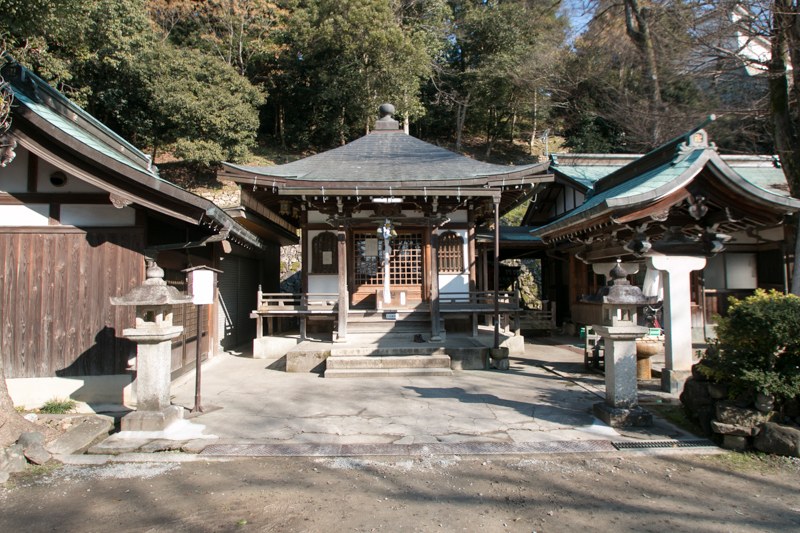 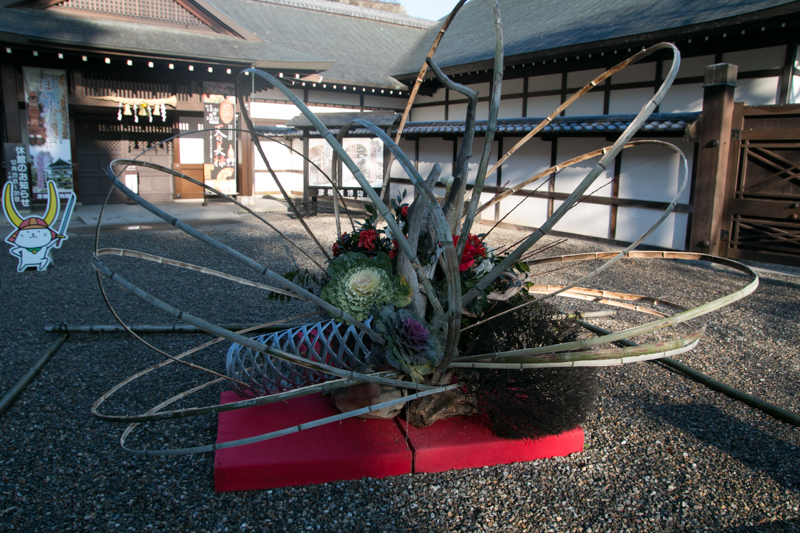 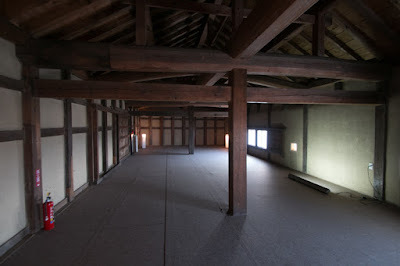 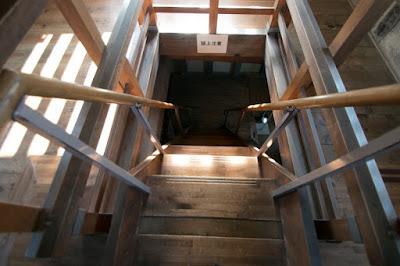 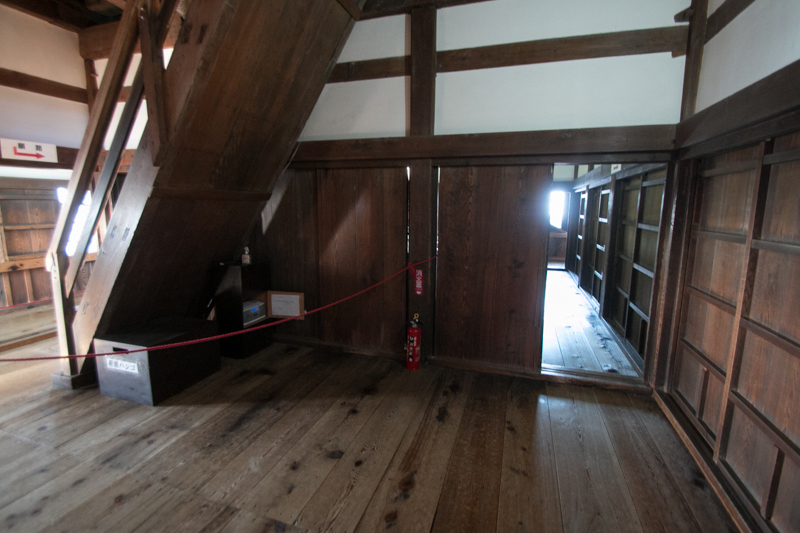 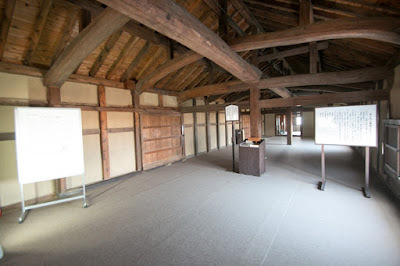 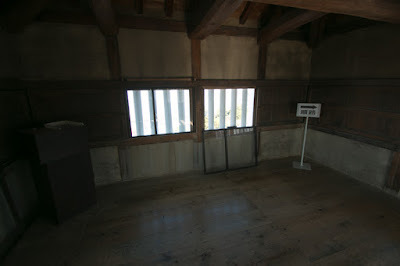 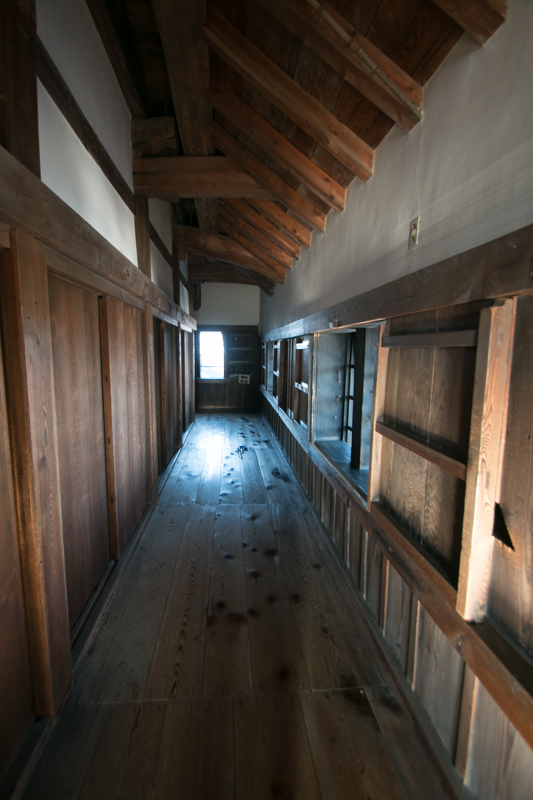 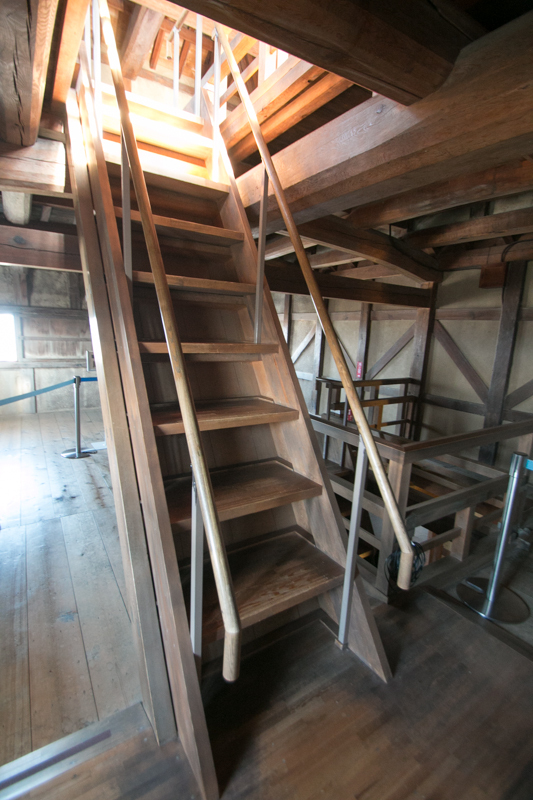 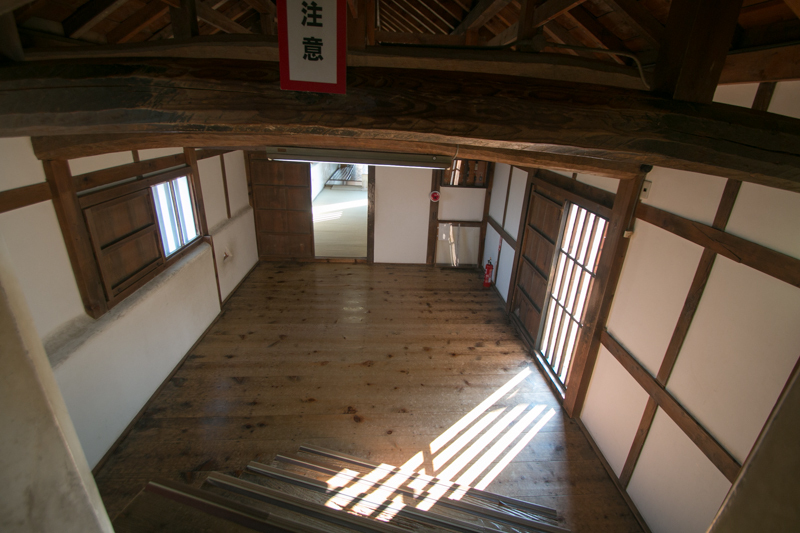 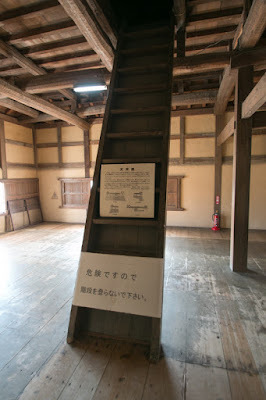 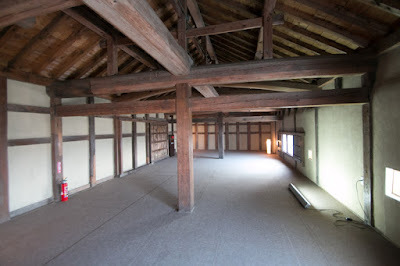 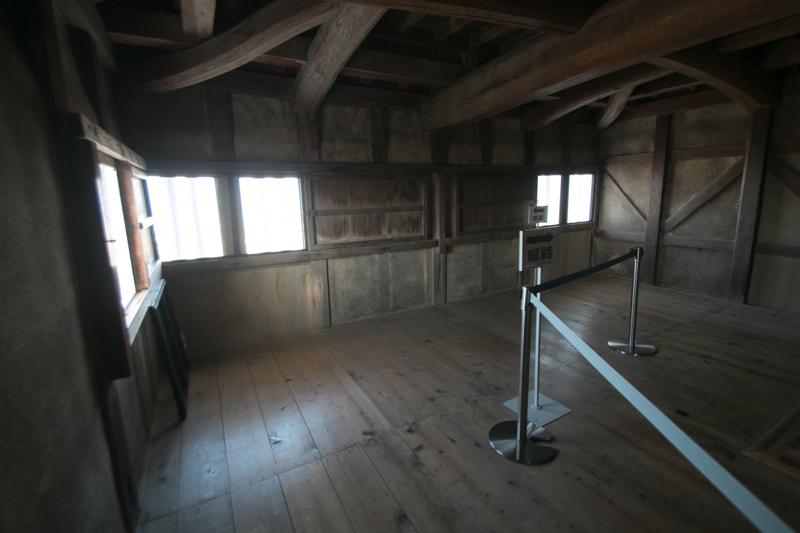 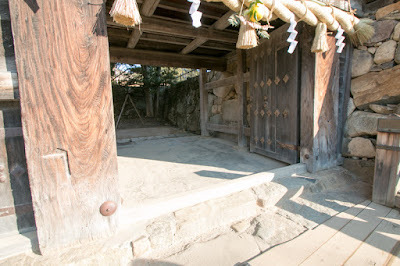 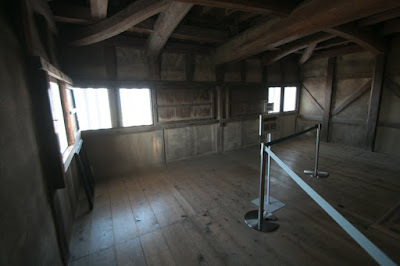 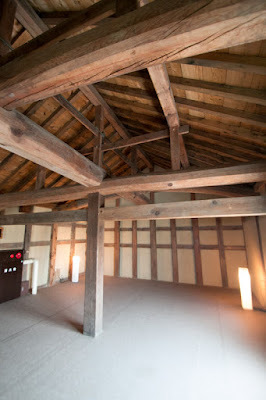 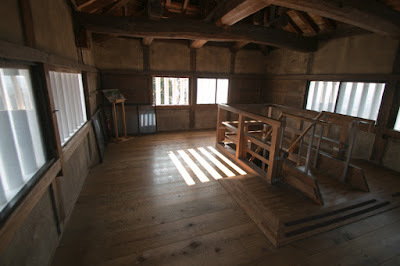 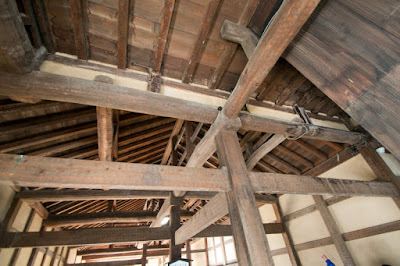 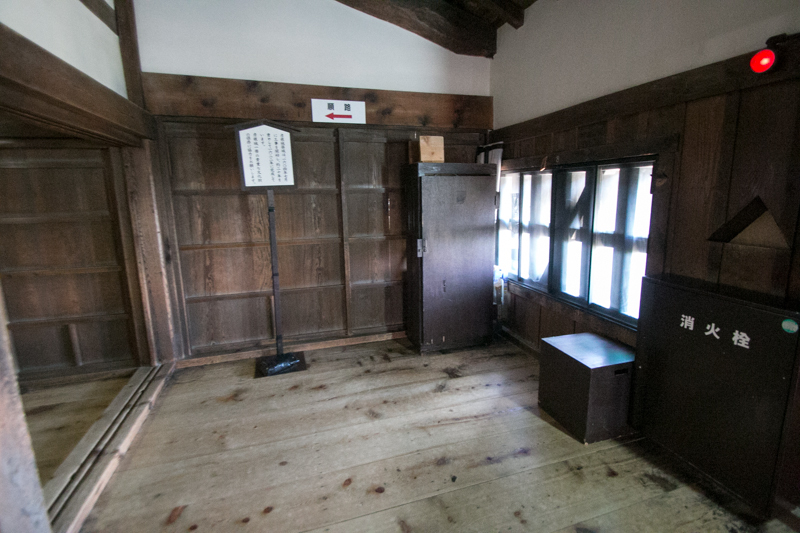 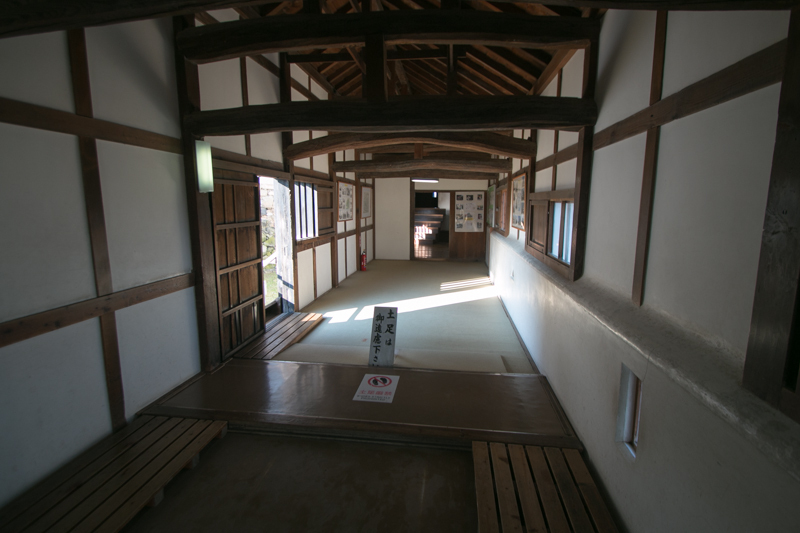 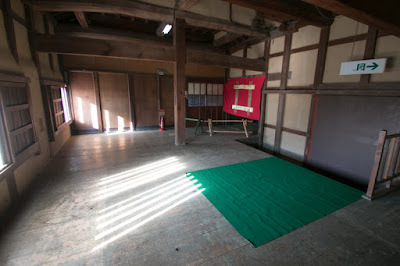 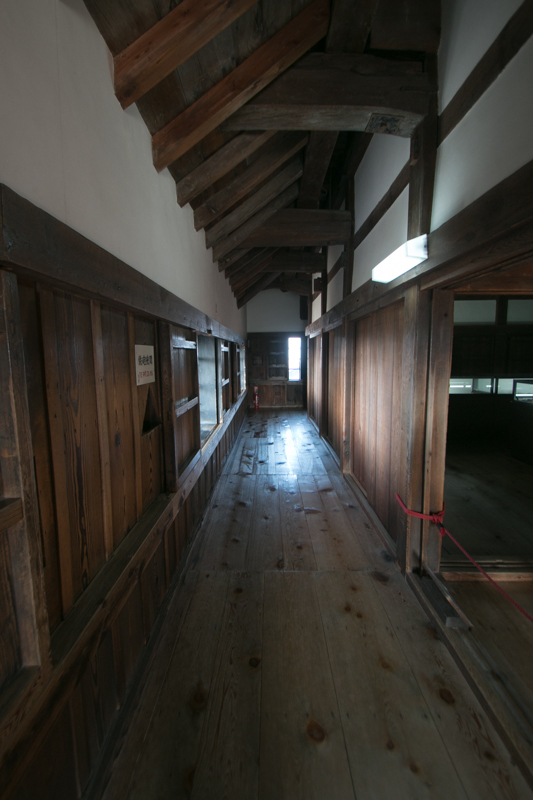 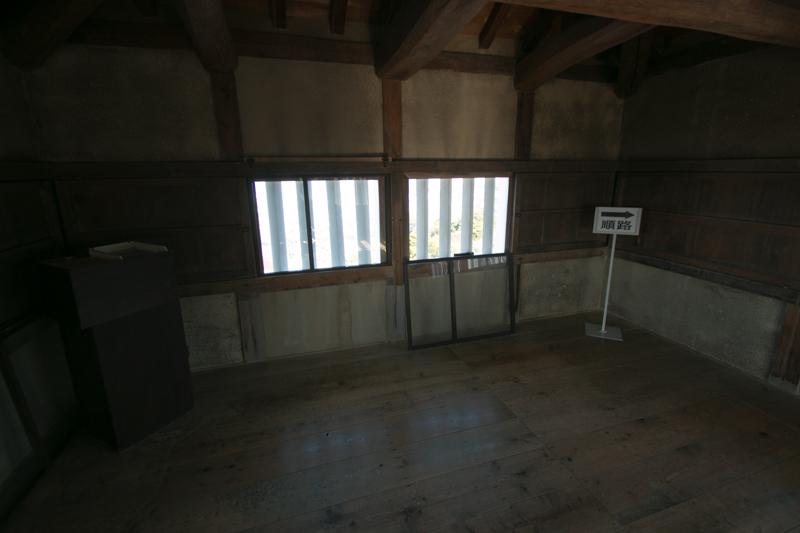 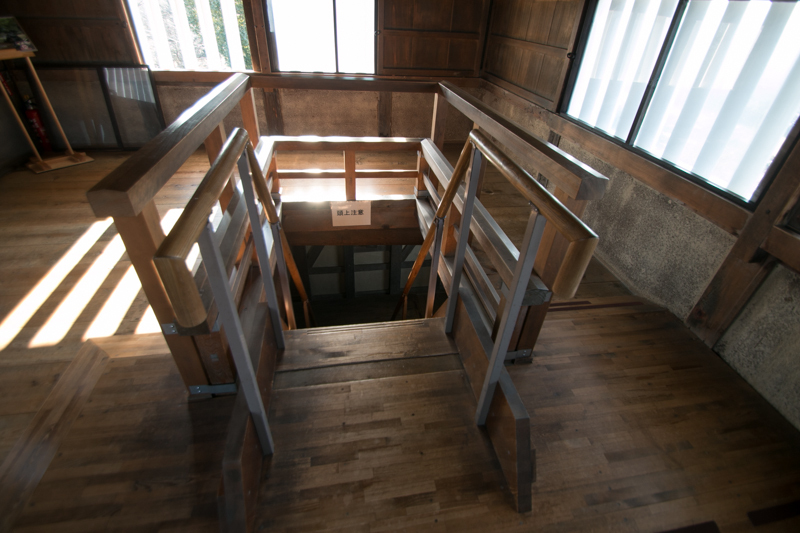 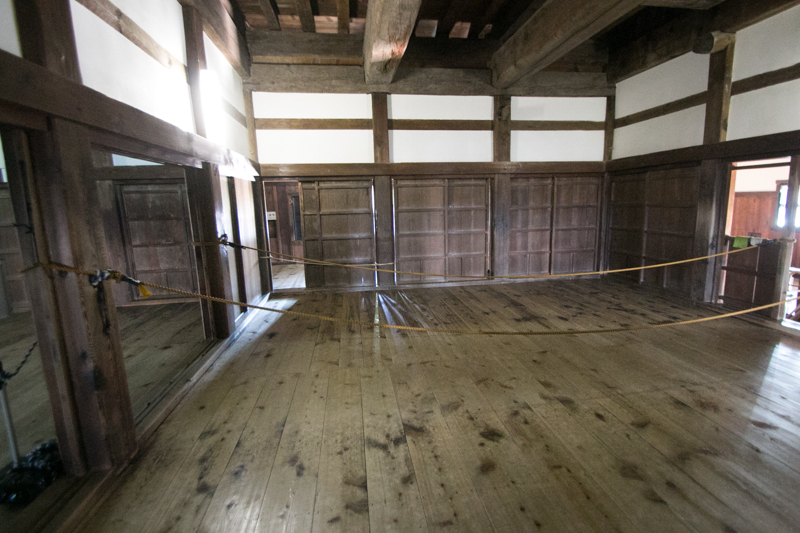 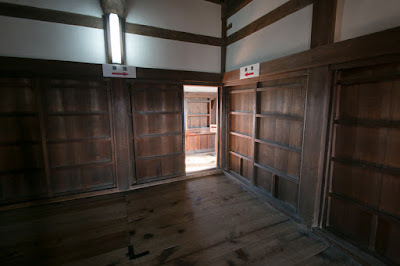 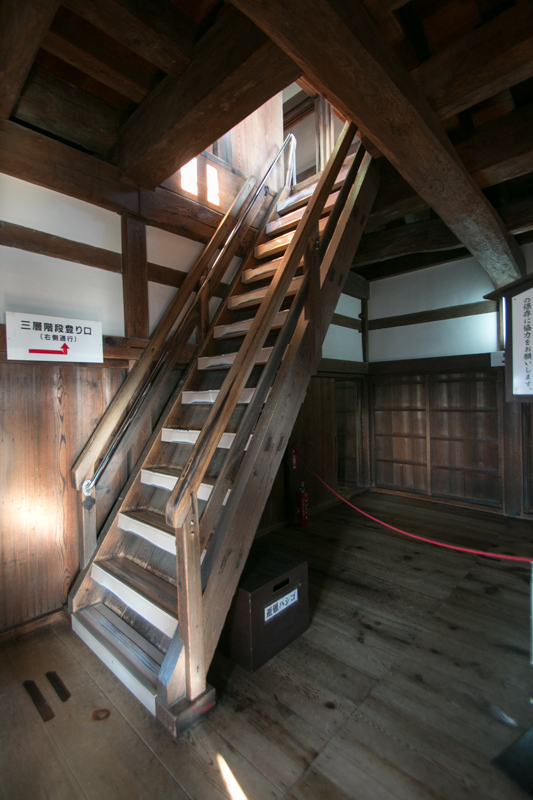 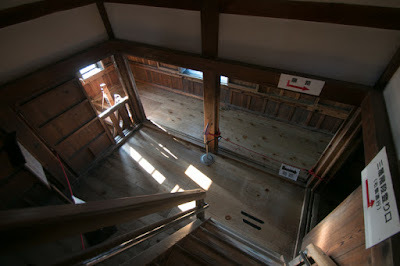 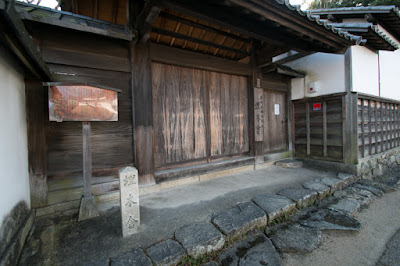 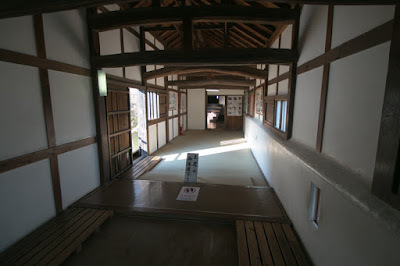 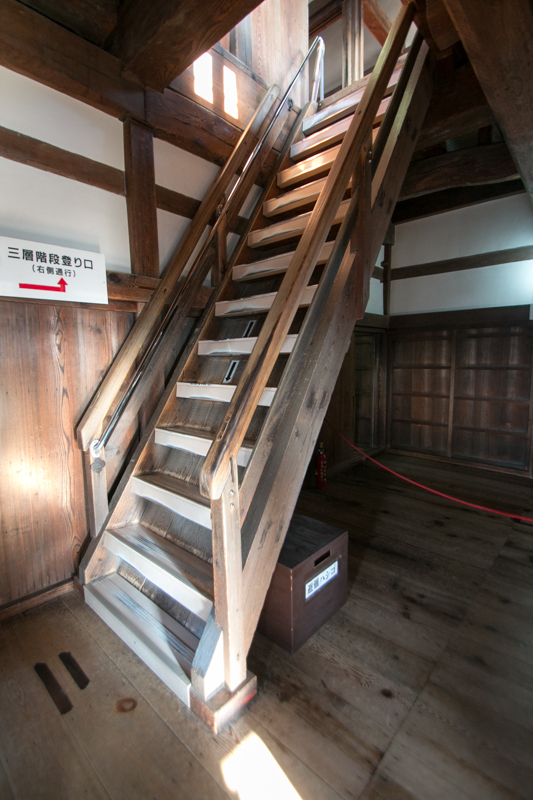 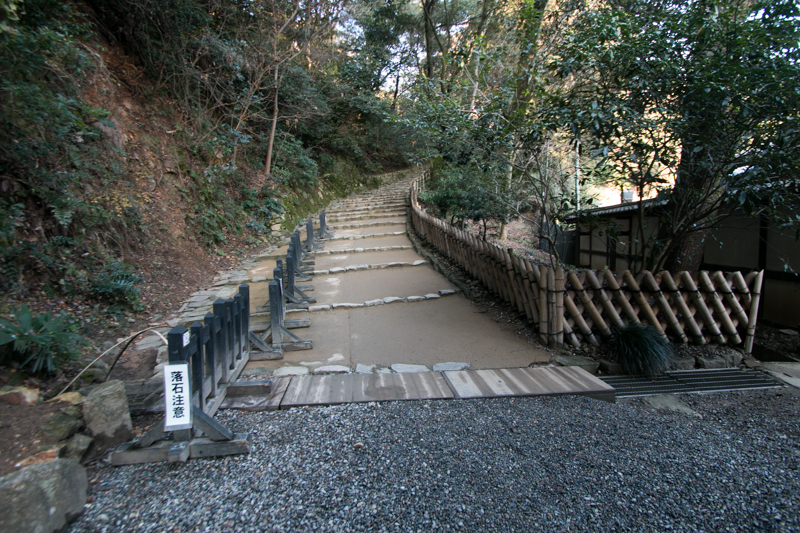 But becamse of the wound during the battle, Naomasa died in 1602 when construction has just started.